An electronic cigarette or e-cigarette[note 1] is a handheld electronic device that simulates the experience of smoking a cigarette. It works by heating a liquid which generates an aerosol, or "vapor", that is inhaled by the user. Using e-cigarettes is commonly referred to as vaping. The liquid in the e-cigarette, called e-liquid, or e-juice, is usually made of nicotine, propylene glycol, glycerine, and flavorings. Not all e-liquids contain nicotine. The health risks of e-cigarettes are uncertain. They are likely safer than tobacco cigarettes, but are of unclear effect in relation to other methods of stopping smoking. Their long-term health effects are not known. They may help some smokers quit. When used by non-smokers, e-cigarettes can lead to nicotine addiction, and there is concern that children could start smoking after using e-cigarettes. So far, no serious adverse effects have been reported in trials. Less serious adverse effects include throat and mouth irritation, vomiting, nausea, and coughing. The majority of toxic chemicals found in tobacco smoke are absent in e-cigarette aerosol. Those present are mostly below 1% of the corresponding levels in tobacco smoke. The aerosol can contain toxicants and traces of heavy metals at levels permissible in inhalation medicines, and potentially harmful chemicals not found in tobacco smoke at concentrations permissible by workplace safety standards. However, chemical concentrations may exceed the stricter public safety limits. The modern e-cigarette was invented in 2003 by Chinese pharmacist Hon Lik. As of 2018 most e-cigarettes are made in China. Their global use has risen exponentially since they were first sold in 2004; their use is widespread in the United States and the United Kingdom. Reasons for using e-cigarettes include trying to quit smoking, reduce risk, or save money, though some use them recreationally. As of 2014, the majority of users still smoke tobacco. There are concerns that dual use of tobacco products and e-cigarettes may "delay or deter quitting". About 60% of UK users are smokers and roughly 40% are ex-smokers. In the UK use among never-smokers was negligible. Because of overlap with tobacco laws and medical drug policies, e-cigarette legislation is debated in many countries. A European directive of 2016 set standards for liquids, vaporizers, ingredients and child-proof liquid containers. As of August 2016, the US FDA extended its regulatory power to include e-cigarettes. There are around 500 brands of e-cigarettes, with global sales in excess of US$7 billion. Electronic cigarettes are also known as e-cigarettes, e-cigs, EC, electronic nicotine delivery systems (ENDS) or electronic non-nicotine delivery systems (ENNDS), electronic smoking devices (ESDs), personal vaporizers, or PVs. They are handheld devices, often made to look like conventional cigarettes, and used in a similar way. E-liquid or juice are names for the flavored solution that goes inside the e-cigarette. An aerosol, or vapor, is produced by heating the e-liquid. Irish public health discussions refer to NMNDS ("non-medicinal nicotine delivery systems"). When the FDA commissioned their 2018 report on ENDS which they label as a Tobacco Product, the authors use the term e-cigarettes for devices using e-liquid without nicotine. Between their introduction to the market in 2004 and approximately 2015, global usage of e-cigarettes rose exponentially. By 2013, there were several million users globally. Awareness and use of e-cigarettes greatly increased in a relatively short period of time. Growth rates in the US and UK slowed in 2015, although use is still increasing. Most users have a history of smoking regular cigarettes. At least 52% of smokers or ex-smokers in one area have vaped. Of smokers who have, one British study reported that less than 15% became everyday e-cigarette users. Though e-cigarette use among those who have never smoked is very low, it continues to rise. One United States survey of e-cigarette users conducted from 2011–2012 found that only 1% of respondents used liquid without nicotine. Everyday use is common among e-cigarette users. Many e-cigarette users are middle-aged men who also smoke traditional cigarettes. E-cigarette use is rising among women. In the US, as of 2014[update], 12.6% of adults had used an e-cigarette at least once and approximately 3.7% were still using them. 1.1% of adults were daily users. Non-smokers and former smokers who had quit more than four years earlier were extremely unlikely to be current users. Former smokers who had recently quit were more than four times as likely to be daily users as current smokers. Experimentation was more common among younger adults, but daily users were more likely to be older adults. In the UK, there were about 2.6 million users in 2015 --- which is about 18% of current smokers and about 5% of the population. 59% of current smokers said they had tried them. Among those who had never smoked, 1.1% said they had tried them and 0.2% still use them. In France in 2014, between 7.7 and 9.2 million people have tried e-cigarettes and 1.1 to 1.9 million use them on a daily basis. 67% of French smokers use e-cigarettes to reduce or quit smoking. Of French people who have tried e-cigarettes, 9% have never smoked tobacco. Of the 1.2% who had recently stopped tobacco smoking at the time of the survey, 84% (or 1% of the population surveyed) credited e-cigarettes as essential in quitting. Because in some jurisdictions, they are cheaper. Marketing aimed at smokers focuses on these motivations. This marketing does influence people to try them. When users were asked why they had first tried e-cigarettes, reasons given were curiosity or experimentation; because a relative was using them; or because they were given or offered one. Some users have stopped vaping due to issues with the devices. Dissatisfaction and concerns over safety can also discourage ongoing e-cigarette use. Users may begin by trying a disposable e-cigarette. They often start with e-cigarettes resembling normal cigarettes, subsequently moving to a later-generation device. Most later-generation e-cigarette users shifted to their present device to get a "more satisfying hit", and users may adjust their devices to provide more vapor for better "throat hits". National Institute on Drug Abuse director Nora Volkow discussing a study that suggests teens using e-cigarettes seem to be more likely to start smoking tobacco. Although smoking among young people has declined over the last five years, this has coincided with a growth in the use of alternative nicotine products. Overall frequency of vaping in minors is low. However, among schoolchildren, e-cigarette use surpasses the use of any other nicotine product. Some young people who have tried an e-cigarette have never smoked tobacco, so vaping can be a starting point for nicotine use. The evidence on whether e-cigarettes are a gateway to tobacco smoking in later life is mixed and contradictory. In the UK, Public Health England say there is no evidence that e-cigarettes increase teen tobacco smoking, and tentative evidence that e-cigarettes divert young people away from cigarettes; but in the US, researchers say use by young people correlates with increased desire to smoke tobacco, and that teenagers who have used an e-cigarette are more inclined to become smokers than those who had not. Most adolescents who vape do not smoke cigarettes. Most say that when they vape, they use liquid without nicotine. Motivation for use by minors is not likely to be associated with quitting smoking. It is more likely to be sensation-seeking or symbolic of rebellion. Appealing flavors are another very commonly cited reason for using e-cigarettes among minors. Some researchers and anti-tobacco advocates are concerned that irresponsible marketing could make e-cigarettes appeal to young people. There is also a risk that infants or toddlers could ingest the e-liquid from an improperly-stored device. About 48% of poison control calls involved exposures in children in 2016. In 2016 there were 2,907 total calls specifically regarding e-cigarettes and liquid nicotine for all age ranges. The number of these calls seems to be trending downward after a peak of 4,023 calls for all ages in 2014. For 2018, the total number of calls for these vape related substance exposures is 2,226 for the first three quarters that have been reported. Public Health England reported that 1.7% of those aged 11–18 years in England had regularly used e-cigarettes in 2018. Regular use was low among those who had never smoked. The emergence of e-cigarettes has given cannabis smokers a new method of inhaling cannabinoids. E-cigarettes, also known as vape pens, cartridges and pens, differ from traditional marijuana cigarettes in several respects. It is assumed that vaporizing cannabinoids at lower temperatures is safer because it produces smaller amounts of toxic substances than the hot combustion of a marijuana cigarette. Recreational cannabis users can discreetly "vape" deodorized cannabis extracts with minimal annoyance to the people around them and less chance of detection, known as "stealth vaping". While cannabis is not readily soluble in the liquid used for e-cigs, recipes containing synthetic cannabinoids which are soluble may be found on the Internet. E-cigarettes may be used with other substances and cartridges can potentially be filled with e-liquid containing substances other than nicotine, thus serving as a new way to deliver other psychoactive drugs, for example THC. Cannabinoid-enriched e-liquids require lengthy, complex processing. Some are available on the Internet despite lack of quality control, expiry date, conditions of preservation, or any toxicological and clinical assessment. The health consequences of vaping cannabis preparations are largely unknown. Exploded view of electronic cigarette with transparent clearomizer and changeable dual-coil head. This model allows for a wide range of settings. Electronic cigarettes can come in very different forms—such as this hand-grenade-shaped variant. The main components of an e-cigarette are a mouthpiece, a cartridge (tank), a heating element/atomizer, a microprocessor, a battery, and possibly an LED light on the end. The only exception to this are mechanical e-cigarettes (mods) which contain no electronics; the circuit is closed by a mechanical action switch. An atomizer comprises a small heating element, or coil, that vaporizes e-liquid and wicking material that draws liquid onto the coil. When the user pushes a button, or (in some variations) activates a pressure sensor by inhaling, the heating element atomizes the liquid solution. The e-liquid reaches a temperature of roughly 100-250 °C within a chamber to create an aerosolized vapor, which the user then inhales, rather than cigarette smoke. The aerosol provides a flavor and feel similar to tobacco smoking. There are three main types of e-cigarettes: cigalikes, looking like cigarettes; eGos, bigger than cigalikes with refillable liquid tanks; and mods, assembled from basic parts or by altering existing products. As the e-cigarette industry continues to evolve, new products are quickly developed and brought to market. First generation e-cigarettes tend to look like tobacco cigarettes and so are called "cigalikes". Most cigalikes look like cigarettes but there is some variation in size. A traditional cigarette is smooth and light while a cigalike is rigid and slightly heavier. Second generation devices are larger overall and look less like tobacco cigarettes. Third generation devices include mechanical mods and variable voltage devices. The fourth generation includes Sub ohm tanks and temperature control devices. The power source is the biggest component of an e-cigarette, which is frequently a rechargeable lithium-ion battery. E-liquid is the mixture used in vapor products such as e-cigarettes and generally consists of propylene glycol, glycerin, water, nicotine, and flavorings. While the ingredients vary the liquid typically contains 95% propylene glycol and glycerin. There are many e-liquids manufacturers in the US and worldwide, and upwards of 8,000 flavors. Industry standards have been created and published by the American E-liquid Manufacturing Standards Association (AEMSA). As of 8 August 2016, the FDA extended its regulatory power to include e-cigarettes, e-liquid and all related products. Under this ruling the FDA will evaluate certain issues, including ingredients, product features and health risks, as well their appeal to minors and non-users. The FDA rule also bans access to minors. As of August 2017, regulatory compliance deadlines relating to premarket review requirements for most e-cigarette and e-liquid products have been extended from November 2017 to 2022. Smokers will get the maximum health benefit if they completely quit all nicotine use. The second-best option for smokers is to switch to approved, regulated nicotine replacement therapy. Most medical organizations, including international organizations such as the WHO and those in the US, feel there is insufficient evidence to routinely recommend electronic cigarettes for use in smoking cessation. Other medical organizations, particularly British ones, state e-cigarettes are a reasonable third-best alternative for those who smoke, are unable to quit, and unwilling to switch to conventional NRT. In 2015, Public Health England stated that e-cigarettes are estimated to be 95% less harmful than smoking. In 2016, The Royal College of Physicians stated that with the current devices on the market a long term vaper should experience under 5% of the harm they would have otherwise been subject to if they continued smoking analog cigarettes. In 2018 the American Cancer Society released a position statement encouraging support for people who choose to use e-cigarettes over traditional clinical methods of smoking cessation. In 2018 the CDC reported that vaping has the potential to benefit current adult smokers who are not pregnant if they are a complete substitute for combustible cigarettes and other smoked tobacco products. CDC launches "Tips From Former Smokers" ad campaign in 2015. The main information on e-cigarettes begins at 24:45. The available research on e-cigarette use for smoking cessation is limited to three randomized controlled trials and some user surveys, case reports, and cohort studies. The most recent Cochrane review concludes, with low confidence, that there is evidence that electronic cigarettes can help smokers quit in the long term compared to placebos, but studies pertaining to their potential impact on smoking cessation and reduction are very limited. Some medical authorities recommend that e-cigarettes have a role in smoking cessation, and others disagree. On the one hand, Public Health England recommends that stop-smoking practitioners should (1) advise people who want to quit to try e-cigarettes if they are failing with conventional nicotine replacement therapy (NRT); and (2) advise people who cannot or do not want to quit to switch to e-cigarettes. On the other hand, the United States Preventive Services Task Force advised only use of conventional NRT products in smoking cessation and found insufficient evidence to recommend e-cigarettes for this purpose. A 2016 meta-analysis based on 20 different studies found that smokers who vaped were 28% less likely to quit than those who had not tried electronic cigarettes. This finding persisted whether the smokers were initially interested in quitting or not. A 2015 meta-analysis on clinical trials found that nicotine-containing e-liquids are more effective than nicotine-free ones for quitting smoking. They compared their finding that nicotine-containing e-cigarettes helped 20% of people quit with the results from other studies that found conventional NRT helps 10% of people quit. There has only been one study directly comparing first generation e-cigarettes to conventional NRT as smoking cessation tools, so the comparative effectiveness is not known. Two 2016 reviews found a trend towards benefit of e-cigarettes with nicotine for smoking cessation, but the evidence was of low quality. Another 2016 review found that the combined abstinence rate among smokers using e-cigarettes in prospective studies was 29.1%. The same review noted that few clinical trials had yet been conducted on their effectiveness, and only one had included a group using other cessation methods. In the US, e-cigarettes have not been subject to the same efficacy testing as nicotine replacement products. Several authorities, including the World Health Organisation, feel there is not enough evidence to recommend e-cigarettes for quitting smoking, and there are studies showing a decline in smoking cessation among dual users. A 2014 review found that e-cigarettes do not seem to improve cessation rates compared to regulated nicotine replacement products, and a trial found 29% of e-cigarette users were still vaping at 6 months, but only 8% of patch users still wore patches at 6 months. There is low-quality evidence that vaping assists smokers to quit smoking in the long-term compared with nicotine-free vaping. Nicotine-containing e-cigarettes were associated with greater effectiveness for quitting smoking than e-cigarettes without nicotine. E-cigarettes without nicotine may reduce tobacco cravings because of the smoking-related physical stimuli. Tobacco harm reduction (THR) is replacing tobacco cigarettes with lower risk products to reduce death and disease. E-cigarettes can reduce smokers' exposure to carcinogens and other toxic substances found in tobacco, and are very likely less harmful than tobacco cigarettes. This is a motivation for many e-cigarette users. Hazards associated with products currently on the market are certainly much lower than smoking. However, harms could be reduced further through appropriate product standards. The British Medical Association encourages health professionals to recommend conventional nicotine replacement therapies, but for patients unwilling to use or continue using such methods, health professionals may present e-cigarettes as a lower-risk option than tobacco smoking. The American Association of Public Health Physicians (AAPHP) suggests those who are unwilling to quit tobacco smoking or unable to quit with medical advice and pharmaceutical methods should consider other nicotine containing products such as electronic cigarettes and smokeless tobacco for long term use instead of smoking. Tobacco smoke contains 100 known carcinogens, and 900 potentially cancer causing chemicals, none of which has been found in more than trace quantities in e-cigarette vapor. A core concern is that smokers who could have quit completely will develop an alternative nicotine addiction instead. A 2014 review stated that promotion of vaping as a harm reduction aid is premature, but they could help to lower tobacco-related death and disease if examined more thoroughly. Another review found that compared with cigarettes, e-cigarettes are likely to be much less, if at all, harmful to users or bystanders. The authors warned against the potential harm of excessive regulation and advised health professionals to consider advising smokers who are reluctant to quit by other methods to switch to e-cigarettes as a safer alternative to smoking. A 2015 Public Health England report concluded that e-cigarette use "releases negligible levels of nicotine into ambient air with no identified health risks to bystanders". A 2014 review recommended that regulations for e-cigarettes could be similar to those for dietary supplements or cosmetic products to not limit their potential for harm reduction. A 2012 review found e-cigarettes could considerably reduce traditional cigarettes use and they likely could be used as a lower risk replacement for traditional cigarettes, but there is not enough data on their safety and efficacy to draw definite conclusions. In an interview, the director of the Office on Smoking and Health for the U.S. federal agency Centers for Disease Control and Prevention (CDC) believes that there is enough evidence to say that using e-cigarettes is likely less harmful than smoking conventional cigarettes. However, due to the lack of regulation of the contents of e-cigarettes and the presence of nicotine, the CDC has issued warnings. A 2014 WHO report concluded that some smokers will switch completely to e-cigarettes from traditional tobacco but a "sizeable" number will use both. This report found that such "dual use" of e-cigarettes and tobacco "will have much smaller beneficial effects on overall survival compared with quitting smoking completely." The safety of electronic cigarettes is uncertain. They may be safer than tobacco cigarettes. There is no ash, tar, carbon and carbon monoxide entering inhaler's lungs. There is considerable variation between vaporizers and in quality of their liquid ingredients and thus the contents of the vapor. Reviews on the safety of electronic cigarettes, analyzing almost the same studies, resulted in substantially different conclusions. In July 2014 the World Health Organization (WHO) report cautioned about potential risks of using e-cigarettes. Regulated US Food and Drug Administration (FDA) products such as nicotine inhalers are probably safer than e-cigarettes. A 2014 systematic review concluded that the risks of e-cigarettes have been exaggerated by health authorities and stated that while there may be some remaining risk, the risk of e-cigarette use is likely small compared to smoking tobacco. The long-term effects of e-cigarette use are unknown. Improvements in lung function and pulmonary health have been demonstrated among smokers who have switched to e-cigarettes. A 2014 Cochrane review found no serious adverse effects reported in clinical trials. Less serious adverse effects from e-cigarette use include throat and mouth irritation, vomiting, nausea, and cough. The evidence suggests they produce less harmful effects than tobacco. A 2014 WHO report said, "ENDS use poses serious threats to adolescents and fetuses." Nicotine exposure can lead to adverse health consequences such as impaired brain and lung development in children. It is also thought that nicotine can create an increased risk of sudden infant death syndrome (SIDS). Other adverse outcomes include disruptive behavioral disorders, attention deficit hyperactivity disorder, reduced respiratory compliance, forced expiratory flow, and impaired lung function. It is also thought that electronic cigarette use can expose individuals to oxidants. Some studies have associated electronic cigarette use with an increased oxidative stress. Aside from toxicity, there are also risks from misuse or accidents such as contact with liquid nicotine, fires caused by vaporizer malfunction, and explosions as result from extended charging, unsuitable chargers, or design flaws. Battery explosions are caused by an increase in internal battery temperature and some have resulted in severe skin burns. There is a small risk of battery explosion in devices modified to increase battery power. The e-liquid has a low level of toxicity, but contamination with various chemicals has been found. The majority of toxic chemicals found in tobacco smoke are absent in e-cigarette vapor. Those which are present are mostly below 1% of the corresponding levels in tobacco smoke, and far below safety limits for occupational exposure. Metal parts of e-cigarettes in contact with the e-liquid can contaminate it with metals. Normal usage of e-cigarettes generates very low levels of formaldehyde. Later-generation e-cigarettes can generate high levels of formaldehyde, but only when they thermally degrade under conditions that bear very little resemblance to how the devices are actually used. Users detect the "dry puff" and avoid it, and the report concluded that "There is no indication that EC users are exposed to dangerous levels of aldehydes." E-cigarette users who use e-cigarettes that contain nicotine are exposed to its potentially harmful effects. Nicotine is associated with cardiovascular disease, potential birth defects, and poisoning. In vitro studies of nicotine have associated it with cancer, but carcinogenicity has not been demonstrated in vivo. There is inadequate research to demonstrate that nicotine is associated with cancer in humans. The risk is probably low from the inhalation of propylene glycol and glycerin. No information is available on the long-term effects of the inhalation of flavors. Most of the cardiovascular effects of ECs are consistent with those of nicotine. According to a 2017 review, it is possible that ECs may have adverse cardiovascular effects on users, especially those who already have cardiovascular disease. However, this review also concluded that "the risk is thought to be less than that of cigarette smoking based on qualitative and quantitative comparisons of EC aerosol versus cigarette smoke constituents." E-cigarettes create vapor that consists of ultrafine particles, with the majority of particles in the ultrafine range. The vapor has been found to contain flavors, propylene glycol, glycerin, nicotine, tiny amounts of toxicants, carcinogens, heavy metals, and metal nanoparticles, and other harmful chemicals. Exactly what comprises the vapor varies in composition and concentration across and within manufacturers. There is a concern that some of the mainstream vapor exhaled by e-cigarette users can be inhaled by bystanders, particularly indoors. E-cigarette use by a parent might lead to inadvertent health risks to offspring. A 2014 review recommended that e-cigarettes should be regulated for consumer safety. There is limited information available on the environmental issues around production, use, and disposal of e-cigarettes that use cartridges. Use of e-cigarettes containing nicotine harms the developing adolescent brain. Human and animal studies have found that nicotine exposure from e-cigarettes during adolescence adversely affects cognitive development, and animal research suggests that it has more severe impacts on the most vulnerable parts of the brain. One such region adversely affected by nicotine within the adolescent brain is the limbic system, which modulates drug reward, cognition, and emotion. Exposure to nicotine during adolescence has also been related to changes in neural circuits, including impairing the development of the prefrontal cortex, which governs judgement and impulse control. Consequently, brain chemistry and neurobehavior is adversely influenced by nicotine exposure. The rise in the use of electronic cigarettes has raised concerns over nicotine overdoses, especially from young children ingesting e-liquids.<McNeill201576 /> Nicotine is poisonous, and e-cigarette use or misuse can lead to nicotine poisoning via ingestion, inhalation, or absorption of nicotine via the skin or eyes, especially for young children. However, 92.5% of exposures to American children were through ingestion. The risk of accidental nicotine exposure from e-cigarettes is most severe in children under age 6, who have a lower median lethal dose than adolescents or adults, and it is worst for 1-year-olds. Early signs of accidental nicotine exposure include quickened heart rate (tachycardia), sweating (diaphoresis), nausea, and vomiting, late effects include low blood pressure (hypotension) and reduced breathing (respiratory depression or hypoventilation), and rare effects include coma, seizure, sustained inability to breath (respiratory arrest), heart attack, and death. Two children in the US and four adults in the US and Europe have died from ingesting liquid nicotine. A 2015 Public Health England report also noted an "unconfirmed newspaper report of a fatal poisoning of a two-year old child" in the UK and two reports of children of similar age who had recovered after ingesting e-liquid and vomiting. They noted case reports of suicides by nicotine. Adults have recovered from drinking e-liquid containing up to 1,500 mg of nicotine (helped by vomiting), but an ingestion of about 10,000 mg was fatal, as was an injection. The report commented that "serious nicotine poisoning seems normally prevented by the fact that relatively low doses of nicotine cause nausea and vomiting, which stops users from further intake." As the usage of e-cigarettes increased between 2012 and 2015, the accidental nicotine exposure rate in the US increased by 1398.2%. In December 2014 for instance, e-cigarette sales in the US were roughly equivalent to just 3.5% of traditional cigarette sales, but e-cigarettes represented 44% of all e-cigarette and traditional cigarette calls to US poison control centers. The accidental nicotine exposure rate in the US has since decreased by 18.9% between July 2016, when the Child Nicotine Poisoning Prevention Act of 2015, a federal law requiring child-resistant packaging for e-liquid, came into effect, and April 2017. According to a regression discontinuity design study by Govindarajan et al. (2018), the 32 states without a preexisting law similar to the Child Nicotine Poisoning Prevention Act experienced a significant drop in the average number of exposures during the 9 months before the Act went into effect compared with the 9 months after. The FDA recommends that e-cigarettes and e-liquids be kept in a safe place, where children and pets do not have access to them. In addition to lack of child-resistant packaging, other factors that the FDA and CDC have attributed to the rise in child ingestion of e-liquid are misbranded sweet e-liquids. Misbranded e-liquids are often sold in packaging that resembles kid-friendly foods, beverages, or candies. Some e-liquids are sold in packaging closely resembling Tree Top-brand juice boxes, Reddi-wip whipped cream, or Sour Patch Kids gummy candy, for example, and children have accidentally drunk these misbranded e-liquids and become sick. The World Health Organization's view regarding second hand aerosol (SHA) is "that while there are a limited number of studies in this area, it can be concluded that SHA is a new air contamination source for particulate matter, which includes fine and ultrafine particles, as well as 1,2-propanediol, some VOCs [volatile organic compounds], some heavy metals, and nicotine" and "[i]t is nevertheless reasonable to assume that the increased concentration of toxicants from SHA over background levels poses an increased risk for the health of all bystanders". Public Health England has concluded that "international peer-reviewed evidence indicates that the risk to the health of bystanders from secondhand e-cigarette vapor is extremely low and insufficient to justify prohibiting e-cigarettes". A systematic review concluded, "the absolute impact from passive exposure to EC [electronic cigarette] vapor has the potential to lead to adverse health effects. The risk from being passively exposed to EC vapor is likely to be less than the risk from passive exposure to conventional cigarette smoke." Nicotine, a key ingredient in most e-liquids, is a highly addictive substance, on a level comparable to heroin and cocaine. Nicotine stimulates regions of the cortex associated with reward, pleasure and reducing anxiety. When nicotine intake stops, withdrawal symptoms include cravings for nicotine, anger/irritability, anxiety, depression, impatience, trouble sleeping, restlessness, hunger or weight gain, and difficulty concentrating. It is not clear whether e-cigarette use will decrease or increase overall nicotine addiction, but the nicotine content in e-cigarettes is adequate to cause or sustain nicotine dependence. E-cigarettes have been advanced as a strategy to reduce the addictive levels of nicotine in cigarettes. Evidence suggests adjusting nicotine levels in paraphernalia can influence addiction, however the negative health effects of nicotine are often ignored. In September 2018, US FDA Commissioner Dr. Scott Gottlieb stated the FDA's position that "the developing adolescent brain is particularly vulnerable to nicotine addiction." Ninety percent of smokers began during adolescence (before 18 years of age). The World Health Organization is concerned about addiction for non-smokers, and the National Institute on Drug Abuse said e-cigarettes could maintain nicotine addiction in those who are attempting to quit. The limited available data suggests that the likelihood of abuse from e-cigarettes is smaller than traditional cigarettes. A 2014 systematic review found that the concerns that e-cigarettes could lead non-smokers to start smoking are unsubstantiated. No long-term studies have been done on the effectiveness of e-cigarettes in treating tobacco addiction, but some evidence suggests that dual use of e-cigarettes and traditional cigarettes may be associated with greater nicotine dependence. Smoking a traditional cigarette yields between 0.5 and 1.5 mg of nicotine, but the nicotine content of the cigarette is only weakly correlated with the levels of nicotine in the smoker's bloodstream. The amount of nicotine in the e-cigarette aerosol varies widely either from puff-to-puff or among products of the same company. In practice e-cigarette users tend to reach lower blood nicotine concentrations than smokers, particularly when the users are inexperienced or using earlier-generation devices. Nicotine in tobacco smoke is absorbed into the bloodstream rapidly, and e-cigarette vapor is relatively slow in this regard. The concentration of nicotine in e-liquid ranges up to 36 mg/mL. New EU regulations cap this at a maximum of 2% (20 mg/mL), but this is an arbitrary ceiling based on limited data. In practice the nicotine concentration in an e-liquid is not a reliable guide to the amount of nicotine that reaches the bloodstream. The earliest e-cigarette can be traced to Herbert A. Gilbert, who in 1963 patented "a smokeless non-tobacco cigarette" that involved "replacing burning tobacco and paper with heated, moist, flavored air". This device produced flavored steam without nicotine. The patent was granted in 1965. There were prototypes, but it received little attention and was never commercialized because smoking was still fashionable at that time. Gilbert said in 2013 that today's electric cigarettes follow the basic design set forth in his original patent. Hon Lik, a Chinese pharmacist and inventor who worked as a research pharmacist for a company producing ginseng products, is credited with the invention of the modern e-cigarette. Hon quit smoking after his father, also a heavy smoker, died of lung cancer. In 2001, he thought of using a high frequency, piezoelectric ultrasound-emitting element to vaporize a pressurized jet of liquid containing nicotine. This design creates a smoke-like vapor. Hon said that using resistance heating obtained better results and the difficulty was to scale down the device to a small enough size. Hon's invention was intended to be an alternative to smoking. 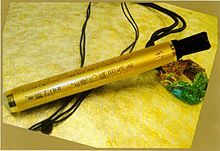 The Ruyan e-cigar was first launched in China in 2004. Hon Lik registered a patent for the modern e-cigarette design in 2003. The e-cigarette was first introduced to the Chinese domestic market in 2004. Many versions made their way to the U.S., sold mostly over the Internet by small marketing firms. E-cigarettes entered the European market and the US market in 2006 and 2007. The company that Hon worked for, Golden Dragon Holdings, registered an international patent in November 2007. The company changed its name to Ruyan (如烟, literally "Resembling smoking") later the same month and started exporting its products. Many US and Chinese e-cig makers copied his designs illegally, so Hon has not received much financial reward for his invention (although some US manufacturers have compensated him through out of court settlements). Ruyan later changed its company name to Dragonite International Limited. Most e-cigarettes today use a battery-powered heating element rather than the earlier ultrasonic technology design. When e-cigarettes entered the international market, some users were dissatisfied with their performance, and the e-cigarette continued to evolve from the first generation three-part device. In 2007 British entrepreneurs Umer and Tariq Sheikh invented the cartomizer. This is a mechanism that integrates the heating coil into the liquid chamber. They launched this new device in the UK in 2008 under their Gamucci brand, and the design is now widely adopted by most "cigalike" brands. Other users tinkered with various parts, such as 18650 flashlights, to produce more satisfactory homemade devices, and the hobby of "modding" was born. The first mod to replace the e-cigarette's case to accommodate a longer-lasting battery, dubbed the "screwdriver", was developed by Ted and Matt Rogers in 2008. Other enthusiasts built their own mods to improve functionality or aesthetics. When pictures of mods appeared at online vaping forums many people wanted them, so some mod makers produced more for sale. The demand for customizable e-cigarettes prompted some manufacturers to produce devices with interchangeable components that could be selected by the user. In 2009, Joyetech developed the eGo series which offered the power of the screwdriver model and a user-activated switch to a wide market. The clearomizer was invented in 2009. Originating from the cartomizer design, it contained the wicking material, an e-liquid chamber, and an atomizer coil within a single clear component. The clearomizer allows the user to monitor the liquid level in the device. Soon after the clearomizer reached the market, replaceable atomizer coils and variable voltage batteries were introduced. Clearomizers and eGo batteries became the best-selling customizable e-cigarette components in early 2012.
International tobacco companies dismissed e-cigarettes as a fad at first. However, recognizing the development of a potential new market sector that could render traditional tobacco products obsolete, they began to produce and market their own brands of e-cigarettes and acquire existing e-cigarette companies. blu eCigs, a prominent US e-cigarette manufacturer, was acquired by Lorillard Inc. in 2012. British American Tobacco was the first tobacco business to sell e-cigarettes in the UK. They launched Vype in 2013, while Imperial Tobacco's Fontem Ventures acquired the intellectual property owned by Hon Lik through Dragonite International Limited for $US 75 million in 2013 and launched Puritane in partnership with Boots UK. On 1 October 2013 Lorillard Inc. acquired another e-cigarette company, this time the UK based company SKYCIG. SKY was rebranded as blu. On 3 February 2014, Altria Group, Inc. acquired popular electronic cigarette brand Green Smoke for $110 million. The deal was finalized in April 2014 for $110 million with $20 million in incentive payments. Altria also markets its own e-cigarette, the MarkTen, while Reynolds American has entered the sector with its Vuse product. Philip Morris, the world's largest tobacco company, purchased UK's Nicocigs in June 2014. On 30 April 2015, Japan Tobacco bought the US Logic e-cigarette brand. Japan Tobacco also bought the UK E-Lites brand in June 2014. On 15 July 2014, Lorillard sold blu to Imperial Tobacco as part of a deal for $7.1 billion. In 2014, dollar sales of customizable e-cigarettes and e-liquid surpassed sales of cigalikes in the US, despite the fact that customizables are less expensive. Consumers of e-cigarettes, sometimes called "vapers", have shown passionate support for e-cigarettes that other nicotine replacement therapies did not receive. This suggests e-cigarettes have potential mass appeal that could challenge combustible tobacco's market position. A subculture of "vapers" has emerged. Members of this emerging subculture often see e-cigarettes as a safer alternative to smoking, and some view it as a hobby. The online forum Electronic Cigarette Forum was one of the first major communities. It and other online forums, such as UKVaper.org, were the origins of the hobby of modding. There are also groups on Facebook and Reddit. Online forums based around modding have grown in the vaping community. Vapers energetically embrace activities associated with e-cigarettes and sometimes act as unpaid evangelists according to a 2014 review. A 2014 Postgraduate Medical Journal editorial stated that e-cigarette companies have a substantial online presence, as well as many individual vapers who blog and tweet about e-cigarette related products. The editorial stated that vapers "also engage in grossly offensive online attacks on anyone who has the temerity to suggest that ENDS are anything other than an innovation that can save thousands of lives with no risks". A 2014 review stated that tobacco and e-cigarette companies interact with consumers for their policy agenda. The companies use websites, social media, and marketing to get consumers involved in opposing bills that include e-cigarettes in smoke-free laws. The same review said this is similar to tobacco industry activity going back to the 1980s. These approaches were used in Europe to minimize the EU Tobacco Product Directive in October 2013. True grassroots lobbying also influenced the TPD decision. Rebecca Taylor, a member of the European Parliament, stated, "to say it's an orchestrated campaign is absolute rubbish." Contempt for "big tobacco" is part of vaping culture. In the United States, vaping has become a major part of youth culture since 2015, especially among teenagers in high school, even though use of e-cigarettes by a minor is illegal. The most popular vaporizer used by American youth is the JUUL. Teenagers use the verb "Juuling" to describe their use of JUUL, and Juuling is a large part of internet culture for young people and the subject of many memes on social media. In 2017, about 13 percent of 8th graders, 24 percent of 10th graders, and nearly 28 percent of 12th graders at American schools reported vaping in the past year, according to research sponsored by the National Institutes of Health. Survey data suggests that teens use e-cigarettes substantially more than cigarettes and that teenagers tend to perceive as e-cigarettes as safer than cigarettes or harmless. Boys are more likely to use e-cigarettes than girls and are twice as likely to use JUUL. Vaping frequently takes place in bathroom stalls at school, and some students are able to vape in class undetected by teachers. There has been an increasing trend in vaping among adolescents. In 2011 the National Youth Tobacco Survey (NYTS) began surveying vaping use. Lifetime use among middle school aged students in 2011 was 1.4% and increased 3% by 2013. Ongoing use (use within 30 days) among middle school students in 2011 was 0.6% and increased to 3.9% by 2014. Among high school students, Lifetime use in 2011 was 4.7% and increased to 11.9% by 2013, and ongoing use was 1.5% in 2011 and increased to 13.4% by 2014. The percentage of electronic-cigarette lifetime use in adults in 2010 was 3.3% and increased to 8.5% by 2013, and ongoing use in 2010 was 1% and increased to 2.6% by 2013. Results in 2018 show continued growth of electronic cigarettes with concern that for combustible cigarettes most addiction begins by age 18 (nearly 90%) with 95% starting smoking by age 21, while 1% of smokers start after age 25. Between 2011 and 2018 the number of youth who have tried vaping has increased from 1.5% to 20.8% of High School students. The NYTS does show a decline in traditional tobacco smoking among these students but with 3.05 million youth illegally accessing an age restricted product as reported in 2018 concerns on their potential nicotine addiction and concerns that they might move from vaping to the more dangerous smoking of tobacco products still arise. Electronic cigarettes only came to market in 2007 in the US. As vaping rises as the alternative nicotine delivery system in American homes the number of people smoking combustible cigarettes has had a mirror effect. Smokers numbered at 42% of the US population in 1965. They declined to a reported 20% from the years 2004 through 2009, dropped to 15.5% in 2016 and most recently 14% in 2017. Since the first National Health Interview Survey in 1965 smoking has declined 67%. As of 2017 the CDC reports 34 million adults are current smokers of combustible cigarettes. 47 million adults use some form of tobacco product. E-cigarette user blowing a cloud of aerosol (vapor). The activity is known as cloud-chasing. Large gatherings of vapers, called vape meets, take place around the US. They focus on e-cig devices, accessories, and the lifestyle that accompanies them. Vapefest, which started in 2010, is an annual show hosted by different cities. People attending these meetings are usually enthusiasts that use specialized, community-made products not found in convenience stores or gas stations. These products are mostly available online or in dedicated "vape" storefronts where mainstream e-cigarettes brands from the tobacco industry and larger e-cig manufacturers are not as popular. Some vape shops have a vape bar where patrons can test out different e-liquids and socialize. The Electronic Cigarette Convention in North America which started in 2013, is an annual show where companies and consumers meet up. A subclass of vapers configure their atomizers to produce large amounts of vapor by using low-resistance heating coils. This practice is called "cloud-chasing" By using a coil with very low resistance, the batteries are stressed to a potentially unsafe extent. This could present a risk of dangerous battery failures. As vaping comes under increased scrutiny, some members of the vaping community have voiced their concerns about cloud-chasing, claiming the practice gives vapers a bad reputation when doing it in public. The Oxford Dictionaries' word of the year for 2014 was "vape". Regulation of e-cigarettes varies across countries and states, ranging from no regulation to banning them entirely. Others have introduced strict restrictions and some have licensed devices as medicines such as in the UK. As of 2015[update], around two thirds of major nations have regulated e-cigarettes in some way. Because of the potential relationship with tobacco laws and medical drug policies, e-cigarette legislation is being debated in many countries. The companies that make e-cigarettes have been pushing for laws that support their interests. In 2016 the US Department of Transportation banned the use of e-cigarettes on commercial flights. This regulation applies to all flights to and from the US. In 2018, the Royal College of Physicians asked that a balance is found in regulations over e-cigarettes that ensure product safety while encouraging smokers to use them instead of analogs, as well as keep an eye on any effects contrary to the control agencies for tobacco. The legal status of e-cigarettes is currently pending in many countries. Many countries such as Brazil, Singapore, the Seychelles, Uruguay, and Norway have banned e-cigarettes. In Canada, they are technically illegal to sell, as no nicotine-containing e-fluid is approved by Health Canada, but this is generally unenforced and they are commonly available for sale Canada-wide. In the US and the UK, the use and sale to adults of e-cigarettes are legal. :US:UK As of 8 August 2016, the FDA extended its regulatory power to include e-cigarettes. Under this ruling the FDA will evaluate certain issues, including ingredients, product features and health risks, as well their appeal to minors and non-users. The FDA rule also bans access to minors. A photo ID is required to buy e-cigarettes, and their sale in all-ages vending machines is not permitted in the US. In May 2016 the FDA used its authority under the Family Smoking Prevention and Tobacco Control Act to deem e-cigarette devices and e-liquids to be tobacco products, which meant it intended to regulate the marketing, labelling, and manufacture of devices and liquids; vape shops that mix e-liquids or make or modify devices were considered manufacturing sites that needed to register with FDA and comply with good manufacturing practice regulation. E-cigarette and tobacco companies have recruited lobbyists in an effort to prevent the FDA from evaluating e-cigarette products or banning existing products already on the market. In February 2014 the European Parliament passed regulations requiring standardization and quality control for liquids and vaporizers, disclosure of ingredients in liquids, and child-proofing and tamper-proofing for liquid packaging. In April 2014 the FDA published proposed regulations for e-cigarettes along similar lines. In the US some states tax e-cigarettes as tobacco products, and some state and regional governments have broadened their indoor smoking bans to include e-cigarettes. As of 9 October 2015, at least 48 states and 2 territories banned e-cigarette sales to minors. In November 2018 the FDA announced new steps to curb youth vaping while still ensuring the adults who would benefit from electronic cigarettes still had access to a healthier nicotine delivery system. Sales of flavored tobacco products will be limited to adult only stores and online vendors with the exception of tobacco, mint or menthol electronic cigarettes that will remain for sales wherever combustible cigarettes are sold (convenience stores). If the FDA does not see a change in the illegal youth access of menthol or minty vapes currently 20% of their use, they will move to adjust their regulations. The decision to allow menthol vapes was to ensure that an alternative was present should an adult go to purchase menthol cigarettes. The FDA has announced a proposed removal of menthol cigarettes from the marketplace they seek to have in place by 2020. Menthol cigarettes are primarily purchased by lower income Americans who have not graduated from college and this population's health needs are underserved. The age verification of online vendors for vape products will see an increased level of security. E-cigarettes have been listed as drug delivery devices in several countries because they contain nicotine, and their advertising has been restricted until safety and efficacy clinical trials are conclusive. Since they do not contain tobacco, television advertising in the US is not restricted. Some countries have regulated e-cigarettes as a medical product even though they have not approved them as a smoking cessation aid. A 2014 review stated the emerging phenomenon of e-cigarettes has raised concerns in the health community, governments, and the general public and recommended that e-cigarettes should be regulated to protect consumers. It added, "heavy regulation by restricting access to e-cigarettes would just encourage continuing use of much unhealthier tobacco smoking." A 2014 review said these products should be considered for regulation in view of the "reported adverse health effects". A 2014 review said, "the e-cigarette companies have been rapidly expanding using aggressive marketing messages similar to those used to promote cigarettes in the 1950s and 1960s." E-cigarettes and nicotine are regularly promoted as safe and beneficial in the media and on brand websites. While advertising of tobacco products is banned in most countries, television and radio e-cigarette advertising in some countries may be indirectly encouraging traditional cigarette smoking. There is no evidence that the cigarette brands are selling e-cigarettes as part of a plan to phase out traditional cigarettes, despite some claiming to want to cooperate in "harm reduction". In the US, six large e-cigarette businesses spent $59.3 million on promoting e-cigarettes in 2013. Easily circumvented age verification at company websites enables young people to access and be exposed to marketing for e-cigarettes. A national US television advertising campaign starred Steven Dorff exhaling a "thick flume" of what the ad describes as "vapor, not tobacco smoke", exhorting smokers with the message "We are all adults here, it's time to take our freedom back." The ads, in a context of longstanding prohibition of tobacco advertising on TV, were criticized by organizations such as Campaign for Tobacco-Free Kids as undermining anti-tobacco efforts. Cynthia Hallett of Americans for Non-Smokers' Rights described the US advertising campaign as attempting to "re-establish a norm that smoking is okay, that smoking is glamorous and acceptable". University of Pennsylvania communications professor Joseph Cappella stated that the setting of the ad near an ocean was meant to suggest an association of clean air with the nicotine product. According to a 2014 review, e-cigarettes are aggressively promoted in the US, mostly via the internet, as a healthy alternative to smoking. Celebrity endorsements are used to encourage e-cigarette use. "Big tobacco" markets e-cigarettes to young people, with industry strategies including cartoon characters and candy flavors to sell e-cigarettes. E-cigarette companies commonly promote that their products contain only water, nicotine, glycerin, propylene glycol, and flavoring but this assertion is misleading as scientists have found differing amounts of heavy metals in the vapor, including chromium, nickel, tin, silver, cadmium, mercury, and aluminum. The assertion that e-cigarettes emit "only water vapor" is false because the evidence indicates e-cigarette vapor contains possibly harmful chemicals such as nicotine, carbonyls, metals, and organic volatile compounds, in addition to particulates. The number of e-cigarettes sold increased every year from 2003 to 2015, when a slowdown in the growth in usage occurred in both the US and the UK. As of 2014[update] there were at least 466 e-cigarette brands. Worldwide e-cigarette sales in 2014 were around US$7 billion. Approximately 30–50% of total e-cigarettes sales are handled on the internet. The consumer preference for e-cigarettes is having a dramatic effect on the tobacco industry. As of 2018[update] most e-cigarette devices were made in China, mainly in Shenzhen. Chinese companies' market share of e-liquid is low. In the US, established tobacco companies have a significant share of the e-cigarette market. In 2015, 80% of all e-cigarette sales in convenience stores in the U.S. were products made by tobacco companies. According to Nielsen Holdings, convenience store e-cigarette sales in the US went down for the first time during the four-week period ending on 10 May 2014. Wells Fargo analyst Bonnie Herzog attributes this decline to a shift in consumers' behavior, buying more specialized devices or what she calls "vapor/tank/mods (VTMs)" that are not tracked by Nielsen. Wells Fargo estimated that VTMs accounted for 57% of the 3.5 billion dollar market in the US for vapor products in 2015. In 2014, the Smoke-Free Alternatives Trade Association estimated that there were 35,000 vape shops in the US, more than triple the number a year earlier. However the 2015 slowdown in market growth affected VTMs as well. The dominance of tobacco companies over the US e-cigarette market has disappeared largely as a result of the rapid rise in popularity of the JUUL e-cigarette, which was introduced in June 2015. As of August 2018[update], JUUL accounts for over 72% of the US e-cigarette market monitored by Nielsen, and its closest competitor—RJ Reynolds' Vuse—makes up less than 10% of the market. JUUL rose to popularity quickly, growing by 700% in 2016 alone. JUUL is a "pod mod" type device, which exclusively uses "pods" (cartridges) of e-liquid rather than a refillable tank, and its popularity has led to a flood of other pod mod devices hitting the American market. In Canada, e-cigarettes had an estimated value of 140 million CAD in 2015. There are numerous e-cigarette retail shops in Canada. A 2014 audit of retailers in four Canadian cities found that 94% of grocery stores, convenience stores, and tobacconist shops which sold e-cigarettes sold nicotine-free varieties only, while all vape shops stocked at least one nicotine-containing product. In the UK in 2015 the "most prominent brands of cigalikes" were owned by tobacco companies, however, with the exception of one model, all the tank types came from "non-tobacco industry companies". Yet some tobacco industry products, while using prefilled cartridges, resemble tank models. France's electronic cigarette market was estimated by Groupe Xerfi to be €130 million in 2015. Additionally, France's e-liquid market was estimated at €265 million. In December 2015, there were 2,400 vape shops in France, 400 fewer than in March of the same year. Industry organization Fivape said the reduction was due to consolidation, not to reduced demand. A JUUL, the most popular type of e-cigarette in the United States. Other devices to deliver inhaled nicotine have been developed. They aim to mimic the ritual and behavioral aspects of traditional cigarettes. British American Tobacco, through their subsidiary Nicoventures, licensed a nicotine delivery system based on existing asthma inhaler technology from UK-based healthcare company Kind Consumer. In September 2014 a product based on this named Voke obtained approval from the United Kingdom's Medicines and Healthcare Products Regulatory Agency. In 2011 Philip Morris International (PMI) bought the rights to a nicotine pyruvate technology developed by Jed Rose at Duke University. The technology is based on the chemical reaction between pyruvic acid and nicotine, which produces an inhalable nicotine pyruvate vapor. Philip Morris International developed the IQOS product. PAX Labs has developed vaporizers that heats the leaves of tobacco to deliver nicotine in a vapor. On 1 June 2015, they introduced JUUL, a type of e-cigarette which delivers 10 times as much nicotine as other e-cigarettes, equivalent to an actual cigarette puff. JUUL was spun off from PAX Labs in December 2017 and is now made by independent company JUUL Labs. BLOW started selling e-hookahs, an electronic version of the hookah, in 2014. Several companies including Canada's Eagle Energy Vapor are selling caffeine-based e-cigarettes instead of nicotine. ^ Electronic cigarettes are variously known as e-cigarettes, e-cigs, EC's, electronic nicotine delivery systems (ENDS) or electronic non-nicotine delivery systems (ENNDS), electronic smoking devices (ESD), vape pens,, vapes, vaporizers/vapourisers (sp), personal vaporizers/personal vaporisers or PV's. ^ a b Tremblay, Marie-Claude; Pluye, Pierre; Gore, Genevieve; Granikov, Vera; Filion, Kristian B.; Eisenberg, Mark J. (3 June 2015). "Regulation profiles of e-cigarettes in the United States: a critical review with qualitative synthesis". BMC Medicine. 13: 130. doi:10.1186/s12916-015-0370-z. ISSN 1741-7015. PMC 4480885. PMID 26041672. ^ Amanda Chicago Lewis (5 October 2017). "Are Weed Vape Pens Safe?". Rolling Stone. Retrieved 31 January 2019. ^ "Is vaping safe?". British Heart Foundation. Retrieved 1 February 2019. ^ a b c d e f Siu, A.L. (22 September 2015). "Behavioral and Pharmacotherapy Interventions for Tobacco Smoking Cessation in Adults, Including Pregnant Women: U.S. Preventive Services Task Force Recommendation Statement". Annals of Internal Medicine. 163 (8): 622–34. doi:10.7326/M15-2023. PMID 26389730. ^ a b c d e f g McRobbie, Hayden; Bullen, Chris; Hartmann-Boyce, Jamie; Hajek, Peter; McRobbie, Hayden (2014). "Electronic cigarettes for smoking cessation and reduction". The Cochrane Database of Systematic Reviews. 12 (12): CD010216. doi:10.1002/14651858.CD010216.pub2. PMID 25515689. ^ a b c d e f g h Ebbert, Jon O.; Agunwamba, Amenah A.; Rutten, Lila J. (2015). "Counseling Patients on the Use of Electronic Cigarettes". Mayo Clinic Proceedings. 90 (1): 128–134. doi:10.1016/j.mayocp.2014.11.004. ISSN 0025-6196. PMID 25572196. ^ a b c Eaton, David L.; Kwan, Leslie Y.; Stratton, Kathleen, eds. (2018-01-23). Public Health Consequences of E-Cigarettes. National Academies Press (US). ISBN 978-0-309-46834-3. LCCN 2018932760. Retrieved 2018-11-01. ^ CDC (30 August 2018). "Electronic Cigarettes". cdc.gov. Retrieved 20 September 2017. ^ a b c d McNeill, A. (August 2015). "E-cigarettes: an evidence update A report commissioned by Public Health England" (PDF). gov.uk. UK: Public Health England. pp. 77–78. ^ Glasser, AM; Collins, L; Pearson, JL; Abudayyeh, H; Niaura, RS; Abrams, DB; Villanti, AC (February 2017). "Overview of Electronic Nicotine Delivery Systems: A Systematic Review". American Journal of Preventive Medicine. 52 (2): e33–e66. doi:10.1016/j.amepre.2016.10.036. PMC 5253272. PMID 27914771. ^ Zborovskaya, Yanina (1 February 2017). "E-Cigarettes and Smoking Cessation: A Primer for Oncology Clinicians". Clinical Journal of Oncology Nursing. 21 (1): 54–63. doi:10.1188/17.CJON.54-63. ISSN 1538-067X. PMID 28107337. ^ "DrugFacts: Cigarettes and Other Tobacco Products". National Institute on Drug Abuse. May 2016. Retrieved 29 May 2016. ^ Royal College of Physicians (27 April 2016). "Nicotine without smoke: Tobacco harm reduction". rcplondon.ac.uk. Retrieved 8 May 2016. ^ a b "Deeming Tobacco Products To Be Subject to the Federal Food, Drug, and Cosmetic Act, as Amended by the Family Smoking Prevention and Tobacco Control Act; Restrictions on the Sale and Distribution of Tobacco Products and Required Warning Statements for Tobacco Products". Federal Register. US Food and Drug Administration. 81 (90): 28974–29106. 10 May 2016. ^ Nutt, DJ; Phillips, LD; Balfour, D; Curran, HV; Dockrell, M; Foulds, J; Fagerstrom, K; Letlape, K; Milton, A; Polosa, R; Ramsey, J; Sweanor, D (2014). "Estimating the harms of nicotine-containing products using the MCDA approach". European Addiction Research. 20 (5): 218–25. doi:10.1159/000360220. PMID 24714502. ^ a b c Caponnetto P.; Russo C.; Bruno C.M. ; Alamo A.; Amaradio M.D. ; Polosa R. (Mar 2013). "Electronic cigarette: a possible substitute for cigarette dependence". Monaldi Archives for Chest Disease. 79 (1): 12–19. doi:10.4081/monaldi.2013.104. PMID 23741941. ^ a b c d e f g h WHO. "Electronic nicotine delivery systems" (PDF). pp. 1–13. Retrieved 28 August 2014. ^ a b c d e f g h i j k l m n o p q r s Grana, R; Benowitz, N; Glantz, SA (13 May 2014). "E-cigarettes: a scientific review". Circulation. 129 (19): 1972–86. doi:10.1161/circulationaha.114.007667. PMC 4018182. PMID 24821826. ^ a b c d e f g h Britton, John; Bogdanovica, Ilze (15 May 2014). "Electronic cigarettes – A report commissioned by Public Health England" (PDF). Public Health England. ^ a b c d e f g Farsalinos, K.E. ; Polosa, R. (2014). "Safety evaluation and risk assessment of electronic cigarettes as tobacco cigarette substitutes: a systematic review". Therapeutic Advances in Drug Safety. 5 (2): 67–86. doi:10.1177/2042098614524430. ISSN 2042-0986. PMC 4110871. PMID 25083263. ^ a b c Burstyn, Igor (2014). "Peering through the mist: systematic review of what the chemistry of contaminants in electronic cigarettes tells us about health risks". BMC Public Health. 14 (1): 18. doi:10.1186/1471-2458-14-18. ISSN 1471-2458. PMC 3937158. PMID 24406205. ^ a b "E-cigarettes: an emerging public health consensus". UK: Public Health England. 15 September 2015. ^ a b c d e f Hajek, P.; Etter, J.F. ; Benowitz, N.; Eissenberg, T.; McRobbie, H. (31 July 2014). "Electronic cigarettes: review of use, content, safety, effects on smokers and potential for harm and benefit". Addiction. 109 (11): 1801–10. doi:10.1111/add.12659. PMC 4487785. PMID 25078252. ^ a b c d e f g Barbara Demick (25 April 2009). "A high-tech approach to getting a nicotine fix". Los Angeles Times. ^ a b Niquette, Mark; Townsend, Matthew (20 July 2018). "Vaping Industry Decries Trump's Tariffs Targeting E-Cigarettes". Bloomberg. Retrieved 4 October 2018. ^ a b c Alawsi, F.; Nour, R.; Prabhu, S. (2015). "Are e-cigarettes a gateway to smoking or a pathway to quitting?". BDJ. 219 (3): 111–115. doi:10.1038/sj.bdj.2015.591. ISSN 0007-0610. PMID 26271862. ^ a b c d e f Rom, Oren; Pecorelli, Alessandra; Valacchi, Giuseppe; Reznick, Abraham Z. (2014). "Are E-cigarettes a safe and good alternative to cigarette smoking?". Annals of the New York Academy of Sciences. 1340 (1): 65–74. Bibcode:2015NYASA1340...65R. doi:10.1111/nyas.12609. ISSN 0077-8923. PMID 25557889. ^ a b c "Use of electronic cigarettes (vapourisers) among adults in Great Britain" (PDF). ASH UK. May 2015. ^ a b Kim, Ki-Hyun; Kabir, Ehsanul; Jahan, Shamin Ara (2016). "Review of electronic cigarettes as tobacco cigarette substitutes: their potential human health impact". Journal of Environmental Science and Health, Part C. 34 (4): 262–275. doi:10.1080/10590501.2016.1236604. ISSN 1059-0501. PMID 27635466. ^ a b "Questions & Answers: New rules for tobacco products". European Commission. 26 February 2014. ^ a b "FDA's New Regulations for E-Cigarettes, Cigars, and All Other Tobacco Products". US Department of Health and Human Services. US Food and Drug Administration. 12 August 2016. ^ a b "Backgrounder on WHO report on regulation of e-cigarettes and similar products". World Health Organization. 26 August 2014. Retrieved 2 June 2015. ^ "Public consultation on legislation in relation to the sale of tobacco products and non-medicinal nicotine delivery systems, including e-cigarettes". Department of Health (Ireland). 2 December 2014. Retrieved 4 October 2016. ^ "Experts Clear the Air on E-Cigarettes". www.mailman.columbia.edu. Columbia University Mailman School of Public Health. Retrieved 3 May 2018. ^ Michael Felberbaum (11 June 2013). "Marlboro Maker To Launch New Electronic Cigarette". The Huffington Post. ^ a b c Mickle, Tripp (17 November 2015). "E-cig sales rapidly lose steam". E-Cigarette Sales Rapidly Lose Steam. Retrieved 6 December 2015. ^ a b West, Robert; Beard, Emma; Brown, Jamie (10 August 2015). "Electronic cigarettes in England – latest trends (STS140122)". Smoking in England. Retrieved 6 December 2015. ^ a b Carroll Chapman, SL; Wu, LT (18 March 2014). "E-cigarette prevalence and correlates of use among adolescents versus adults: A review and comparison". Journal of Psychiatric Research. 54: 43–54. doi:10.1016/j.jpsychires.2014.03.005. PMC 4055566. PMID 24680203. ^ a b c Bullen, Christopher (2014). "Electronic Cigarettes for Smoking Cessation". Current Cardiology Reports. 16 (11): 538. doi:10.1007/s11886-014-0538-8. ISSN 1523-3782. PMID 25303892. ^ a b Born, H.; Persky, M.; Kraus, D.H.; Peng, R.; Amin, M.R. ; Branski, R.C. (2015). "Electronic Cigarettes: A Primer for Clinicians". Otolaryngology–Head and Neck Surgery. 153 (1): 5–14. doi:10.1177/0194599815585752. ISSN 0194-5998. PMID 26002957. ^ a b c d e Pepper, J. K.; Brewer, N. T. (2013). "Electronic nicotine delivery system (electronic cigarette) awareness, use, reactions and beliefs: a systematic review". Tobacco Control. 23 (5): 375–384. doi:10.1136/tobaccocontrol-2013-051122. ISSN 0964-4563. PMC 4520227. PMID 24259045. ^ Suter, Melissa A.; Mastrobattista, Joan; Sachs, Maike; Aagaard, Kjersti (2015). "Is There Evidence for Potential Harm of Electronic Cigarette Use in Pregnancy?". Birth Defects Research Part A: Clinical and Molecular Teratology. 103 (3): 186–195. doi:10.1002/bdra.23333. ISSN 1542-0752. PMC 4830434. PMID 25366492. ^ a b c d Delnevo, Cristine D.; Giovenco, Daniel P.; Steinberg, Michael B.; Villanti, Andrea C.; Pearson, Jennifer L.; Niaura, Raymond S.; Abrams, David B. (2 November 2015). "Patterns of Electronic Cigarette Use Among Adults in the United States". Nicotine & Tobacco Research. 18 (5): 715–719. doi:10.1093/ntr/ntv237. PMC 5896829. PMID 26525063. ^ a b c d e f McNeill, A, SC (2015). "E – cigarettes: an evidence update A report commissioned by Public Health England" (PDF). gov.uk. UK: Public Health England. Retrieved 19 August 2015. ^ "Over 2 million Britons now regularly use electronic cigarettes". ASH UK. 28 April 2014. Retrieved 30 May 2014. ^ "Use of electronic cigarettes in Great Britain" (PDF). ASH. ASH. July 2014. Retrieved 18 September 2014. ^ a b c "Prévalence, comportements d'achat et d'usage, motivations des utilisateurs de la cigarette électronique" (PDF). Observatoire Français des Drogues et des Toxicomanies. 12 February 2014. Retrieved 28 March 2014. ^ Aguilar, Carmen (11 June 2018). "Lung cancer deaths on the rise in two thirds of European countries". VOXEUROP/EDJNet. Retrieved 24 August 2018. ^ Tomashefski, A (21 March 2016). "The perceived effects of electronic cigarettes on health by adult users: A state of the science systematic literature review". Journal of the American Association of Nurse Practitioners. 28 (9): 510–5. doi:10.1002/2327-6924.12358. PMID 26997487. ^ a b Schraufnagel, Dean E. (2015). "Electronic Cigarettes: Vulnerability of Youth". Pediatric Allergy, Immunology, and Pulmonology. 28 (1): 2–6. doi:10.1089/ped.2015.0490. ISSN 2151-321X. PMC 4359356. PMID 25830075. ^ a b c d e Orellana-Barrios, Menfil A.; Payne, Drew; Mulkey, Zachary; Nugent, Kenneth (2015). "Electronic cigarettes-a narrative review for clinicians". The American Journal of Medicine. 128 (7): 674–81. doi:10.1016/j.amjmed.2015.01.033. ISSN 0002-9343. PMID 25731134. ^ a b c d Brandon, T.H. ; Goniewicz, M.L. ; Hanna, N.H.; Hatsukami, D.K. ; Herbst, R.S. ; Hobin, J.A. ; Ostroff, J.S. ; Shields, P.G. ; Toll, B.A. ; Tyne, C.A. ; Viswanath, K.; Warren, G.W. (2015). "Electronic Nicotine Delivery Systems: A Policy Statement from the American Association for Cancer Research and the American Society of Clinical Oncology". Clinical Cancer Research. 21 (3): 514–525. doi:10.1158/1078-0432.CCR-14-2544. ISSN 1078-0432. PMID 25573384. ^ a b Yingst, J. M.; Veldheer, S.; Hrabovsky, S.; Nichols, T. T.; Wilson, S. J.; Foulds, J. (2015). "Factors associated with electronic cigarette users' device preferences and transition from first generation to advanced generation devices". Nicotine Tob Res. 17 (10): 1242–6. doi:10.1093/ntr/ntv052. ISSN 1462-2203. PMC 4592341. PMID 25744966. ^ "More than a quarter-million youth who had never smoked a cigarette used e-cigarettes in 2013". Centers for Disease Control and Prevention. January 2016. Retrieved 8 July 2015. ^ Volkow, Nora (August 2015). "Teens Using E-cigarettes More Likely to Start Smoking Tobacco". National Institute on Drug Abuse. ^ Lauterstein, Dana; Hoshino, Risa; Gordon, Terry; Watkins, Beverly-Xaviera; Weitzman, Michael; Zelikoff, Judith (2014). "The Changing Face of Tobacco Use Among United States Youth". Current Drug Abuse Reviews. 7 (1): 29–43. doi:10.2174/1874473707666141015220110. ISSN 1874-4737. PMC 4469045. PMID 25323124. ^ "E-cigarette use triples among middle and high school students in just one year". CDC. January 2016. Retrieved 15 December 2015. ^ a b Hildick-Smith, Gordon J.; Pesko, Michael F.; Shearer, Lee; Hughes, Jenna M.; Chang, Jane; Loughlin, Gerald M.; Ipp, Lisa S. (2015). "A Practitioner's Guide to Electronic Cigarettes in the Adolescent Population". Journal of Adolescent Health. 57 (6): 574–9. doi:10.1016/j.jadohealth.2015.07.020. ISSN 1054-139X. PMID 26422289. ^ a b "DrugFacts: Electronic Cigarettes (e-Cigarettes)". National Institute on Drug Abuse. September 2014. Retrieved 15 October 2014. ^ a b c d Centers for Disease Control and Prevention, (CDC) (6 September 2013). "Notes from the field: electronic cigarette use among middle and high school students – United States, 2011–2012". MMWR. Morbidity and Mortality Weekly Report. 62 (35): 729–30. PMC 4585627. PMID 24005229. ^ "Teens like different forms of tobacco and nicotine". American Cancer Society. Archived from the original on 20 September 2015. Retrieved 18 August 2015. ^ "Position Statement on Electronic Cigarettes [ECs] or Electronic Nicotine Delivery Systems [ENDS]" (PDF). The International Union against Tuberculosis and Lung Disease. October 2013. ^ Korioth, Trisha (2013-10-04). "E-cigarettes easy to buy, can hook kids on nicotine". AAP News: E131004–4. doi:10.1542/aapnews.20131004-4 (inactive 2018-10-28). Retrieved 17 November 2013. ^ Soneji, S; Barrington-Trimis, J; Wills, T (26 June 2017). "Association Between Initial Use of e-Cigarettes and Subsequent Cigarette Smoking Among Adolescents and Young Adults, A Systematic Review and Meta-analysis". JAMA Pediatrics. 171 (8): 788–797. doi:10.1001/jamapediatrics.2017.1488. PMC 5656237. PMID 28654986. ^ a b E-Cigarette Use Among Youth and Young Adults: A Report of the Surgeon General (PDF) (Report). Rockville, MD: U.S. Department of Health and Human Services, Centers for Disease Control and Prevention, National Center for Chronic Disease Prevention and Health Promotion, Office on Smoking and Health. 2016. p. 40. Retrieved 1 November 2018. ^ a b Kong, G.; Morean, M.E. ; Cavallo, D.A. ; Camenga, D.R. ; Krishnan-Sarin, S. (2014). "Reasons for Electronic Cigarette Experimentation and Discontinuation Among Adolescents and Young Adults". Nicotine & Tobacco Research. 17 (7): 847–54. doi:10.1093/ntr/ntu257. ISSN 1462-2203. PMC 4674436. PMID 25481917. ^ a b Linda Bauld; Kathryn Angus; Marisa de Andrade (May 2014). "E-cigarette uptake and marketing" (PDF). Public Health England. pp. 1–19. ^ a b c d Chatham-Stephens, Kevin (20 October 2014). "Young Children and e-Cigarette Poisoning". Medscape. Retrieved 26 October 2018. ^ Gummin, David D.; Mowry, James B.; Spyker, Daniel A.; Brooks, Daniel E.; Fraser, Michael O.; Banner, William (26 November 2017). "2016 Annual Report of the American Association of Poison Control Centers' National Poison Data System (NPDS): 34th Annual Report". Clinical Toxicology. 55 (10): 1072–1254. doi:10.1080/15563650.2017.1388087. ISSN 1556-3650. PMID 29185815. ^ "American Association of Poison Control Centers (AAPCC) - E-Cigarettes and Liquid Nicotine". aapcc.org. Retrieved 27 October 2018. ^ "Regular e-cigarette use remains low in young people and stable in adults, PHE report finds". Pharmaceutical Journal. 28 February 2019. Retrieved 10 April 2019. ^ a b c d e f g h i j k l Giroud, Christian; de Cesare, Mariangela; Berthet, Aurélie; Varlet, Vincent; Concha-Lozano, Nicolas; Favrat, Bernard (1 August 2015). "E-Cigarettes: A Review of New Trends in Cannabis Use". International Journal of Environmental Research and Public Health. 12 (8): 9988–10008. doi:10.3390/ijerph120809988. ISSN 1660-4601. PMC 4555324. PMID 26308021. ^ Abuse, National Institute on Drug. "Electronic Cigarettes (e-Cigarettes)". drugabuse.gov. Retrieved 27 January 2016. ^ "Electronic Cigarette Fires and Explosions" (PDF). U.S. Fire Administration. 2014. pp. 1–11. ^ "What is an e-Cigarette MOD E-cig 101". 19 February 2014. ^ "Vaper Talk – The Vaper's Glossary". Spinfuel eMagazine. 5 July 2013. Retrieved 18 November 2014. ^ a b c Rowell, Temperance R.; Tarran, Robert (2015). "Will Chronic E-Cigarette Use Cause Lung Disease?". American Journal of Physiology. Lung Cellular and Molecular Physiology. 309 (12): L1398–409. doi:10.1152/ajplung.00272.2015. ISSN 1040-0605. PMC 4683316. PMID 26408554. ^ a b c d Cheng, T. (2014). "Chemical evaluation of electronic cigarettes". Tobacco Control. 23 (Supplement 2): ii11–ii17. doi:10.1136/tobaccocontrol-2013-051482. ISSN 0964-4563. PMC 3995255. PMID 24732157. ^ a b c Caponnetto, Pasquale; Campagna, Davide; Papale, Gabriella; Russo, Cristina; Polosa, Riccardo (2012). "The emerging phenomenon of electronic cigarettes". Expert Review of Respiratory Medicine. 6 (1): 63–74. doi:10.1586/ers.11.92. ISSN 1747-6348. PMID 22283580. ^ Glasser, A. M.; Cobb, C. O.; Teplitskaya, L.; Ganz, O.; Katz, L.; Rose, S. W.; Feirman, S.; Villanti, A. C. (2015). "Electronic nicotine delivery devices, and their impact on health and patterns of tobacco use: a systematic review protocol". BMJ Open. 5 (4): e007688. doi:10.1136/bmjopen-2015-007688. ISSN 2044-6055. PMC 4420972. PMID 25926149. ^ a b c d Farsalinos KE, Spyrou A, Tsimopoulou K, Stefopoulos C, Romagna G, Voudris V (2014). "Nicotine absorption from electronic cigarette use: Comparison between first and new-generation devices". Scientific Reports. 4: 4133. Bibcode:2014NatSR...4E4133F. doi:10.1038/srep04133. PMC 3935206. PMID 24569565. ^ a b c d e Garner, Charles; Stevens, Robert (February 2014). "A Brief Description of History, Operation and Regulation" (PDF). Coresta. Archived from the original (PDF) on 3 March 2016. Retrieved 21 February 2016. ^ a b c Oh, Anne Y.; Kacker, Ashutosh (December 2014). "Do electronic cigarettes impart a lower potential disease burden than conventional tobacco cigarettes? : Review on e-cigarette vapor versus tobacco smoke". The Laryngoscope. 124 (12): 2702–2706. doi:10.1002/lary.24750. PMID 25302452. ^ Jimenez Ruiz, CA; Solano Reina, S; de Granda Orive, JI; Signes-Costa Minaya, J; de Higes Martinez, E; Riesco Miranda, JA; Altet Gómez, N; Lorza Blasco, JJ; Barrueco Ferrero, M; de Lucas Ramos, P (August 2014). "The electronic cigarette. Official statement of the Spanish Society of Pneumology and Thoracic Surgery (SEPAR) on the efficacy, safety and regulation of electronic cigarettes". Archivos de Bronconeumologia. 50 (8): 362–7. doi:10.1016/j.arbres.2014.02.006. PMID 24684764. ^ John Reid Blackwell. "Avail Vapor offers glimpse into the 'art and science' of e-liquids". Richmond Times-Dispatch. Retrieved 23 November 2015. ^ Products, Center for Tobacco. "How Do FDA's Tobacco Regulations Affect You?". Retrieved 30 August 2017. ^ a b Commissioner, Office of the. "Consumer Updates - The Facts on the FDA's New Tobacco Rule". www.fda.gov. Retrieved 30 August 2017. ^ U.S. FDA Center for Tobacco Products (4 August 2017). "Rules, Regulations & Guidance - Extension of Certain Tobacco Product Compliance Deadlines Related to the Final Deeming Rule (Revised)". www.fda.gov. Retrieved 17 September 2017. ^ U.S. FDA Center for Tobacco Products (August 2017). "Extension of Certain Tobacco Product Compliance Deadlines Related to the Final Deeming Rule: Guidance for Industry (Revised)" (PDF). www.fda.gov. Retrieved 17 September 2017. ^ "Electronic Cigarettes (e-Cigarettes)". US Food and Drug Administration. Retrieved 6 November 2014. ^ Framework Convention Alliance on Tobacco Control. "FCA Policy briefing Electronic Nicotine Delivery Systems" (PDF). fctc.org. Retrieved 2 March 2016. ^ a b c McNeill, A, SC (2015). "E – cigarettes: an evidence update A report commissioned by Public Health England" (PDF). gov.uk. UK: Public Health England. p. 15. Retrieved 24 August 2015. ^ National Centre for Smoking Cessation and Training. "Electronic cigarettes: A briefing for stop smoking services". ncsct.co.uk. Retrieved 2 March 2016. ^ McNeill, A, SC (2015). "E – cigarettes: an evidence update A report commissioned by Public Health England" (PDF). gov.uk. UK: Public Health England. p. 76. Retrieved 19 August 2015. ^ "Smoking and health (1962)". RCP London. 10 September 2015. Retrieved 3 May 2018. ^ "American Cancer Society Position Statement on Electronic Cigarettes". www.cancer.org. American Cancer Society. Retrieved 2 May 2018. ^ Health, CDC's Office on Smoking and (26 April 2018). "CDC - Electronic Cigarettes - Smoking & Tobacco Use". Smoking and Tobacco Use. Retrieved 2 May 2018. ^ "CDC launches powerful new ads in 'Tips From Former Smokers' campaign". Centers for Disease Control and Prevention. 26 March 2015. ^ Knight-West, O; Bullen, C (2016). "E-cigarettes for the management of nicotine addiction". Substance Abuse and Rehabilitation. 7: 111–8. doi:10.2147/SAR.S94264. PMC 4993405. PMID 27574480. ^ Hartman-Boyce, Jamie; McRobbie, Hayden; al, et (2016). "Electronic cigarettes for smoking cessation". Cochrane Database of Systematic Reviews. 9: CD010216. doi:10.1002/14651858.CD010216.pub3. PMID 27622384. ^ El Dib, R; Suzumura, EA; Akl, EA; Gomaa, H; Agarwal, A; Chang, Y; Prasad, M; Ashoorion, V; Heels-Ansdell, D; Maziak, W; Guyatt, G (23 February 2017). "Electronic nicotine delivery systems and/or electronic non-nicotine delivery systems for tobacco smoking cessation or reduction: a systematic review and meta-analysis". BMJ Open. 7 (2): e012680. doi:10.1136/bmjopen-2016-012680. PMC 5337697. PMID 28235965. ^ a b Kalkhoran, Sara; Glantz, Stanton A (2016). "E-cigarettes and smoking cessation in real-world and clinical settings: a systematic review and meta-analysis". The Lancet Respiratory Medicine. 4 (2): 116–128. doi:10.1016/s2213-2600(15)00521-4. PMC 4752870. PMID 26776875. ^ a b c Rahman, Muhammad Aziz (30 March 2015). "E-Cigarettes and Smoking Cessation: Evidence from a Systematic Review and Meta-Analysis". PLOS ONE. 10 (3): e0122544. Bibcode:2015PLoSO..1022544R. doi:10.1371/journal.pone.0122544. PMC 4378973. PMID 25822251. ^ Khoudigian, S; Devji, T; Lytvyn, L; Campbell, K; Hopkins, R; O'Reilly, D (29 January 2016). "The efficacy and short-term effects of electronic cigarettes as a method for smoking cessation: a systematic review and a meta-analysis". International Journal of Public Health. 61 (2): 257–67. doi:10.1007/s00038-016-0786-z. PMID 26825455. ^ Malas, M; van der Tempel, J; Schwartz, R; Minichiello, A; Lightfoot, C; Noormohamed, A; Andrews, J; Zawertailo, L; Ferrence, R (25 April 2016). "Electronic Cigarettes for Smoking Cessation: A Systematic Review". Nicotine & Tobacco Research. 18 (10): 1926–1936. doi:10.1093/ntr/ntw119. PMID 27113014. ^ Orellana-Barrios, MA; Payne, D; Medrano-Juarez, RM; Yang, S; Nugent, K (October 2016). "Electronic Cigarettes for Smoking Cessation". The American Journal of the Medical Sciences. 352 (4): 420–426. doi:10.1016/j.amjms.2016.07.013. PMID 27776725. ^ a b Hartmann-Boyce, Jamie; McRobbie, Hayden; Bullen, Chris; Begh, Rachna; Stead, Lindsay F; Hajek, Peter; Hartmann-Boyce, Jamie (2016). "Electronic cigarettes for smoking cessation". Cochrane Database Syst Rev. 9: CD010216. doi:10.1002/14651858.CD010216.pub3. PMID 27622384. ^ a b c d e Cahn, Z.; Siegel, M. (February 2011). "Electronic cigarettes as a harm reduction strategy for tobacco control: a step forward or a repeat of past mistakes?". Journal of Public Health Policy. 32 (1): 16–31. doi:10.1057/jphp.2010.41. PMID 21150942. ^ Saitta, D.; Ferro, G.A. ; Polosa, R. (3 February 2014). "Achieving appropriate regulations for electronic cigarettes". Therapeutic Advances in Chronic Disease. 5 (2): 50–61. doi:10.1177/2040622314521271. PMC 3926346. PMID 24587890. ^ Franck, C.; Filion, K.B. ; Kimmelman, J.; Grad, R.; Eisenberg, M.J. (17 May 2016). "Ethical considerations of e-cigarette use for tobacco harm reduction". Respiratory Research. 17 (1): 53. doi:10.1186/s12931-016-0370-3. PMC 4869264. PMID 27184265. ^ "BMA calls for stronger regulation of e-cigarettes" (PDF). British Medical Association. Retrieved 18 November 2013. ^ "Principles to Guide AAPHP Tobacco Policy". American Association of Public Health Physicians. Retrieved 31 July 2013. ^ a b c Drummond, M.B. ; Upson, D (February 2014). "Electronic cigarettes: Potential harms and benefits". Annals of the American Thoracic Society. 11 (2): 236–42. doi:10.1513/annalsats.201311-391fr. PMC 5469426. PMID 24575993. ^ McNeill, A, SC (2015). "E – cigarettes: an evidence update A report commissioned by Public Health England" (PDF). gov.uk. UK: Public Health England. p. 65. Retrieved 20 August 2015. ^ a b c d Saitta, D; Ferro, GA; Polosa, R (Mar 2014). "Achieving appropriate regulations for electronic cigarettes". Therapeutic Advances in Chronic Disease. 5 (2): 50–61. doi:10.1177/2040622314521271. PMC 3926346. PMID 24587890. ^ a b Edgar, Julie. "E-Cigarettes: Expert Q&A With the CDC". WebMD. Retrieved 17 November 2013. ^ Detailed reference list is located on a separate image page. ^ a b c Bhatnagar, A.; Whitsel, L.P.; Ribisl, K.M. ; Bullen, C.; Chaloupka, F.; Piano, M.R. ; Robertson, R.M. ; McAuley, T.; Goff, D.; Benowitz, N. (24 August 2014). "Electronic Cigarettes: A Policy Statement From the American Heart Association". Circulation. 130 (16): 1418–1436. doi:10.1161/CIR.0000000000000107. PMID 25156991. ^ Cancer Research UK. "Cancer Research UK Briefing: Electronic Cigarettes" (PDF). cancerresearchuk.org. Retrieved 20 March 2016. ^ "E-cigarettes: How "safe" are they?". The Journal of Family Practice. 65 (6). June 2016. Retrieved 29 September 2018. ^ Odum, L.E. ; O'Dell, K.A. ; Schepers, J.S. (December 2012). "Electronic cigarettes: do they have a role in smoking cessation?". Journal of Pharmacy Practice. 25 (6): 611–4. doi:10.1177/0897190012451909. PMID 22797832. ^ O'Connor, R.J. (March 2012). "Non-cigarette tobacco products: what have we learnt and where are we headed?". Tobacco Control. 21 (2): 181–90. doi:10.1136/tobaccocontrol-2011-050281. PMC 3716250. PMID 22345243. ^ Farsalinos, Konstantinos E; Le Houezec, Jacques (29 September 2015). "Regulation in the face of uncertainty: the evidence on electronic nicotine delivery systems (e-cigarettes)". Risk Management and Healthcare Policy. 8: 157–167. doi:10.2147/RMHP.S62116. PMC 4598199. PMID 26457058. ^ Polosa R, Campagna D, Caponnetto P (2015). "What to advise to respiratory patients intending to use electronic cigarettes". Discov Med. 20 (109): 155–61. PMID 26463097. ^ Polosa R (2015). "Electronic cigarette use and harm reversal: emerging evidence in the lung". BMC Med. 13: 54. doi:10.1186/s12916-015-0298-3. PMC 4365531. PMID 25857426. ^ "The Potential Adverse Health Consequences of Exposure to Electronic Cigarettes and Electronic Nicotine Delivery Systems". Oncology Nursing Forum. 42 (5): 445–446. 2015. doi:10.1188/15.ONF.445-446. ISSN 0190-535X. PMID 26302273. ^ a b c d e f g h i England, Lucinda J.; Bunnell, Rebecca E.; Pechacek, Terry F.; Tong, Van T.; McAfee, Tim A. (2015). "Nicotine and the Developing Human". American Journal of Preventive Medicine. 49 (2): 286–93. doi:10.1016/j.amepre.2015.01.015. ISSN 0749-3797. PMC 4594223. PMID 25794473. ^ Cai, H; Wang, C (2017). "Graphical review: The redox dark side of e-cigarettes; exposure to oxidants and public health concerns". Redox Biology. 13 (13): 402–406. doi:10.1016/j.redox.2017.05.013. PMC 5493817. PMID 28667909. ^ a b Durmowicz, E.L. (2014). "The impact of electronic cigarettes on the paediatric population". Tobacco Control. 23 (Supplement 2): ii41–ii46. doi:10.1136/tobaccocontrol-2013-051468. ISSN 0964-4563. PMC 3995262. PMID 24732163. ^ a b Bertholon, J.F. ; Becquemin, M.H. ; Annesi-Maesano, I.; Dautzenberg, B. (2013). "Electronic Cigarettes: A Short Review". Respiration. 86 (5): 433–8. doi:10.1159/000353253. ISSN 1423-0356. PMID 24080743. ^ McNeill, A, PH. "Underpinning evidence for the estimate that e-cigarette use is around 95% safer than smoking: authors' note". gov.uk. Public Health England. Retrieved 27 May 2016. ^ a b Polosa, R.; Campagna, D.; Caponnetto, P. (September 2015). "What to advise to respiratory patients intending to use electronic cigarettes". Discovery Medicine. 20 (109): 155–61. PMID 26463097. ^ Kosmider, Leon; et al. (September 2014). "Carbonyl Compounds in Electronic Cigarette Vapors: Effects of Nicotine Solvent and Battery Output Voltage". Nicotine & Tobacco Research. 16 (10): 1319–1326. doi:10.1093/ntr/ntu078. ISSN 1462-2203. PMC 4838028. PMID 24832759. ^ "The Health Consequences of Smoking—50 Years of Progress: A Report of the Surgeon General, 2014, Chapter 5 - Nicotine" (PDF). Surgeon General of the United States. 2014. pp. 107–138. ^ Benowitz, NL; Fraiman, JB (23 March 2017). "Cardiovascular effects of electronic cigarettes". Nature Reviews Cardiology. 14 (8): 447–456. doi:10.1038/nrcardio.2017.36. PMC 5519136. PMID 28332500. ^ Pisinger, Charlotta; Døssing, Martin (December 2014). "A systematic review of health effects of electronic cigarettes". Preventive Medicine. 69: 248–260. doi:10.1016/j.ypmed.2014.10.009. PMID 25456810. ^ Chang, H. (2014). "Research gaps related to the environmental impacts of electronic cigarettes". Tobacco Control. 23 (Supplement 2): ii54–ii58. doi:10.1136/tobaccocontrol-2013-051480. ISSN 0964-4563. PMC 3995274. PMID 24732165. ^ a b c Yuan, Menglu; Cross, Sarah (2015). "Nicotine and the adolescent brain". Journal of Physiology. 593 (16): 3397–3412. doi:10.1113/JP270492. PMC 4560573. PMID 26018031. ^ a b c d e f g h Govindarajan, Preethi; Spiller, Henry A.; Casavant, Marcel J.; Chounthirath, Thitphalak; Smith, Gary A. (23 April 2018). "E-Cigarette and Liquid Nicotine Exposures Among Young Children". Pediatrics. 141 (5): –20173361. doi:10.1542/peds.2017-3361. ISSN 1098-4275. PMID 29686144. Retrieved 3 August 2018. ^ "Newsroom - Some E-cigarette Users Are Having Seizures, Most Reports Involving Youth and Young Adults". www.fda.gov. ^ Hua, My; Talbot, Prue (2016). "Potential health effects of electronic cigarettes: A systematic review of case reports". Preventive Medicine Reports. 4: 169–178. doi:10.1016/j.pmedr.2016.06.002. ISSN 2211-3355. PMC 4929082. PMID 27413679. ^ a b Chatham-Stephens, Kevin; Law, Royal; Taylor, Ethel; Kieszak, Stephanie; Melstrom, Paul; Bunnell, Rebecca; Wang, Baoguang; Day, Hannah; Apelberg, Benjamin; Cantrell, Lee; Foster, Howell; Schier, Joshua G. (June 2016). "Exposure Calls to U. S. Poison Centers Involving Electronic Cigarettes and Conventional Cigarettes—September 2010–December 2014". Journal of Medical Toxicology. 12 (4): 350–357. doi:10.1007/s13181-016-0563-7. ISSN 1556-9039. PMC 5135675. PMID 27352081. ^ "Do You Vape? See These Tips on How to Keep E-Liquids Away from Children". United States Department of Health and Human Services. United States Food and Drug Administration. 2 May 2018. This article incorporates text from this source, which is in the public domain. ^ a b c Gottlieb, Scott (23 August 2018). "Companies cease sales of e-liquids with labeling or advertising that resembled kid-friendly foods following FDA, FTC warnings" (Press release). Silver Spring, MD: Food and Drug Administration. Retrieved 26 October 2018. ^ "E-Liquids Misleadingly Labeled or Advertised as Food Products". Center for Tobacco Products. FDA. 25 September 2018. Retrieved 26 October 2018. ^ Public Health England. "E-cigarettes in public places and workplaces: a 5-point guide to policy making". uk.gov. Retrieved 7 May 2017. ^ Hess, IM; Lachireddy, K; Capon, A (15 April 2016). "A systematic review of the health risks from passive exposure to electronic cigarette vapour". Public Health Research & Practice. 26 (2). doi:10.17061/phrp2621617. PMID 27734060. ^ "State Health Officer's Report on E-Cigarettes: A Community Health Threat" (PDF). California Tobacco Control Program. California Department of Public Health. January 2015. Archived from the original (PDF) on 29 January 2015. ^ Linda J. Vorvick (29 August 2013). "Nicotine and Tobacco". Medline Plus. Retrieved 21 May 2015. ^ Palazzolo, Dominic L. (Nov 2013). "Electronic cigarettes and vaping: a new challenge in clinical medicine and public health. A literature review". Frontiers in Public Health. 1 (56): 56. doi:10.3389/fpubh.2013.00056. PMC 3859972. PMID 24350225. ^ a b Schroeder, M.J.; Hoffman, A.C. (2014). "Electronic cigarettes and nicotine clinical pharmacology". Tobacco Control. 23 (Supplement 2): ii30–ii35. doi:10.1136/tobaccocontrol-2013-051469. ISSN 0964-4563. PMC 3995273. PMID 24732160. ^ Gottlieb, Scott (12 September 2018). "FDA takes new steps to address epidemic of youth e-cigarette use, including a historic action against more than 1,300 retailers and 5 major manufacturers for their roles perpetuating youth access" (Press release). Silver Spring, MD: Food and Drug Administration. Retrieved 26 October 2018. ^ Evans, S.E. ; Hoffman, A.C. (2014). "Electronic cigarettes: abuse liability, topography and subjective effects". Tobacco Control. 23 (Supplement 2): ii23–ii29. doi:10.1136/tobaccocontrol-2013-051489. ISSN 0964-4563. PMC 3995256. PMID 24732159. ^ Goniewicz, Maciej L.; Hajek, Peter; McRobbie, Hayden (2014). "Nicotine content of electronic cigarettes, its release in vapour and its consistency across batches: regulatory implications" (PDF). Addiction. 109 (3): 500–507. doi:10.1111/add.12410. ISSN 0965-2140. PMID 24345184. ^ Noah Charney (7 December 2014). "America's vaping revolution: How suspicious should we really be of the e-cigarette craze?". Salon magazine. ^ "US Patent 3200819. Smokeless non-tobacco cigarette". Retrieved 29 February 2012. ^ a b c Mary Bellis (2015). "Who Invented Electronic Cigarettes?". About.com. ^ a b P.H. (17 March 2014). "A case of the vapers". The Economist. ^ Millstein, Seth (25 April 2009). "The Push to Ban E-Cigarettes: Where's the Proof?". TimeLine. Archived from the original on 2 July 2015. Retrieved 18 February 2016. ^ "Electronic Cigarette Sales on the Rise". WalesOnline. 24 August 2011. ^ a b c d Sridi, Nicolas (10 July 2013). "I was sure that the electronic cigarette would be welcomed with open arms". Sciences et Avenir. ^ "Electronic Atomization Cigarette". Worldwide.espacenet.com. 22 November 2007. ^ a b "Dragonite Sells E-Vapor Business To ITG". Convenient Store Decisions. 21 August 2013. ^ Tom Hancock (1 October 2013). "China's e-cigarette inventor fights for financial rewards". Fox News Channel. ^ a b c d e f g Michael Grothaus (1 October 2014). "Trading addictions: the inside story of the e-cig modding scene". Engadget. ^ a b Annabel Denham (10 June 2013). "Brothers who took a punt on a new market". CityAM. Retrieved 4 April 2014. ^ a b c d e f g Mike K (9 June 2015). "What Does The Future Hold For Vaping Technology?". Steve K's Vaping World. ^ Akam, Simon (27 May 2015). "Big Tobacco fights back: how the cigarette kings bought the vaping industry". Newsweek. Retrieved 22 February 2016. ^ "Kodak moment". The Economist. 28 September 2013. Retrieved 11 March 2014. ^ a b Mike Esterl (3 February 2014). "Altria Expands in E-Cigarettes With Green Smoke". The Wall Street Journal. Retrieved 7 March 2014. ^ Brian Montopoli (11 June 2013). "Tobacco companies bet on electronic cigarettes". CBS News. Retrieved 16 August 2013. ^ Sanchez Manning (29 July 2013). "British American Tobacco enters electronic cigarette market in Britain with the 'Vype'". The Independent. ^ Gustafsson, Katarina (2 September 2013). "Imperial Tobacco Agrees to Acquire Dragonite's E-Cigarette Unit". Bloomberg. Retrieved 20 November 2013. ^ "Lorillard, Inc. Acquires British-based SKYCIG, Expanding its Electronic Cigarette Business". Archived from the original on 4 October 2013. Retrieved 1 October 2013. ^ "Lorillard to Rebrand SKYCIG as blu eCigs". Convenience Store News. 27 March 2014. ^ a b "Altria Completes Acquisition of Green Smoke". BusinessWire. 1 April 2014. Retrieved 21 November 2014. ^ Gideon Spanier (26 June 2014). "Philip Morris buys e-cigarette maker Nicocigs as it warns of falling profits". The Independent. ^ a b "Japan Tobacco's Global Ambitions Lead to Logic Acquisition". Convenience Store News. 30 April 2015. Retrieved 29 September 2018. ^ Mangan, Dan (15 July 2014). "Feeling blu? E-cig company spun off in major tobacco deal". CNBC. ^ Koebler, Jason (25 September 2014). "Big Tobacco Has Officially Lost Its Hold on the E-Cigarette Market". Motherboard. Retrieved 25 February 2016. ^ a b c d e Couts, Andrew (13 May 2013). "Inside the world of vapers, the subculture that might save smokers' lives". Digital Trends. Retrieved 20 November 2013. ^ Park, Andy (26 August 2013). "The Feed: The subculture around e-cigarettes". SBS World News. Retrieved 20 November 2013. ^ Barbeau, Amanda M; Burda, Jennifer; Siegel, Michael (2013). "Perceived efficacy of e-cigarettes versus nicotine replacement therapy among successful e-cigarette users: a qualitative approach". Addiction Science & Clinical Practice. 8 (1): 5. doi:10.1186/1940-0640-8-5. ISSN 1940-0640. PMC 3599549. PMID 23497603. ^ a b Eric Larson (25 January 2014). "Pimp My Vape: The Rise of E-Cigarette Hackers". Mashable. Retrieved 22 November 2014. ^ Molly Osberg (25 February 2014). "CVape life: welcome to the weird world of e-cig evangelists". The Verge. ^ a b McKee, M. (2014). "Electronic cigarettes: peering through the smokescreen". Postgraduate Medical Journal. 90 (1069): 607–609. doi:10.1136/postgradmedj-2014-133029. ISSN 0032-5473. PMID 25294933. ^ a b Jacobs, Emma; Robinson, Duncan (17 April 2014). "E-cigarettes: no smoke without fear". FT Magazine. Retrieved 11 January 2016. ^ Tom Gara (14 April 2014). "Are E-Cigarettes Losing Ground in the Vapor Market?". The Wall Street Journal. ^ Sottile, Leah (8 October 2014). "The Right to Vape". The Atlantic. Retrieved 28 February 2016. ^ Bach, Laura (21 August 2018). "JUUL and Youth: Rising E-Cigarette Popularity" (PDF). Campaign for Tobacco Free Kids. Retrieved 1 November 2018. ^ "FDA Regulations for Tobacco Product Retailers". Center for Tobacco Products. FDA. 31 October 2018. Retrieved 1 November 2018. ^ a b Barshad, Amos (7 April 2018). "The Juul Is Too Cool". The New York Times. Retrieved 29 September 2018. ^ Zernike, Kate (2 April 2018). "'I Can't Stop': Schools Struggle With Vaping Explosion". The New York Times. Retrieved 1 November 2018. ^ a b c Kimberly Suiters (31 January 2018). "Are your kids juuling at school? 7 On Your Side investigates". WJLA-TV. ^ a b Richtel, Matt; Kaplan, Sheila (27 August 2018). "Did Juul Lure Teenagers and Get 'Customers for Life'?". The New York Times. ^ "Monitoring the Future Survey: High School and Youth Trends". National Institute on Drug Abuse. NIH. December 2017. Retrieved 1 November 2018. ^ a b Willett, Jeffrey G; Bennett, Morgane; Hair, Elizabeth C; Xiao, Haijuan; Greenberg, Marisa S; Harvey, Emily; Cantrell, Jennifer; Vallone, Donna (18 April 2018). "Recognition, use and perceptions of JUUL among youth and young adults" (PDF). Tobacco Control: tobaccocontrol–2018–054273. doi:10.1136/tobaccocontrol-2018-054273. PMID 29669749. ^ Chen, Angus (4 December 2017). "Teenagers Embrace JUUL, Saying It's Discreet Enough To Vape In Class". NPR. Retrieved 24 September 2018. ^ a b c Arrazola, RA; Neff, LJ; Kennedy, SM; Holder-Hayes, E; Jones, CD (14 November 2014). "Tobacco Use Among Middle and High School Students — United States, 2013". MMWR Morb. Mortal. Wkly. Rep. 63 (45): 1021–1026. PMC 5779356. PMID 24699766. ^ King, BA; Patel, R (2014). "Trends in awareness and use of electronic cigarettes among US adults, 2010-2013". Nicotine & Tobacco Research. 17 (2): 219–227. doi:10.1093/ntr/ntu191. PMC 4512831. PMID 25239961. ^ Products, Office of the Commissioner, Center for Tobacco. "Press Announcements - Statement from FDA Commissioner Scott Gottlieb, M.D., on proposed new steps to protect youth by preventing access to flavored tobacco products and banning menthol in cigarettes". www.fda.gov. Retrieved 2018-11-24. ^ Cullen, Karen A.; Ambrose, Bridget K.; Gentzke, Andrea S.; Apelberg, Benjamin J.; Jamal, Ahmed; King, Brian A. (2018-11-16). "Notes from the Field: Use of Electronic Cigarettes and Any Tobacco Product Among Middle and High School Students — United States, 2011–2018". MMWR. Morbidity and Mortality Weekly Report. 67 (45): 1276–1277. doi:10.15585/mmwr.mm6745a5. ISSN 0149-2195. ^ "U.S. smoking rate drops to new low". Retrieved 2018-11-25. ^ "In US, cigarette smoking rate declines to new low". Retrieved 2018-11-24. ^ Gavin Haynes (22 April 2015). "Daft vapers: the competitive world of e-cigarette smoking". The Guardian. ^ Mike Esterl (29 May 2014). "'Vaporizers' Are the New Draw in E-Cigarettes". The Wall Street Journal. ^ Staff (13 February 2014). "Generation V E-Cigarettes and Vape Bar aims to convert smokers to e-cigarettes". Daily Nebraskan. ^ Neil Nisperos (4 September 2014). "Vaping convention coming to Ontario Convention Center Friday". Inland Valley Daily Bulletin. ^ Mary Plass (29 January 2014). "The Cloud Chasers". Vape News Magazine. ^ a b c Sean Cooper (23 May 2014). "What you need to know about vaporizers". Engadget. ^ Dominique Mosbergen (5 August 2014). "This Man Is An Athlete In The Sport Of 'Cloud Chasing'". The Huffington Post. ^ Victoria Bekiempis (1 April 2015). "Veteran E-Cigarette Users Fret 'Cloud Chasers' Give Them a Bad Name". Newsweek. ^ Fallon, Claire (19 November 2014). "'Vape' Is Oxford Dictionaries' Word Of The Year". The Huffington Post. ^ Etter, J. F.; Bullen, C.; Flouris, A. D.; Laugesen, M.; Eissenberg, T. (May 2011). "Electronic nicotine delivery systems: a research agenda". Tobacco Control. 20 (3): 243–8. doi:10.1136/tc.2010.042168. PMC 3215262. PMID 21415064. ^ a b Beard, Emma; Shahab, Lion; Cummings, Damian M.; Michie, Susan; West, Robert (2016). "New Pharmacological Agents to Aid Smoking Cessation and Tobacco Harm Reduction: What Has Been Investigated, and What Is in the Pipeline?". CNS Drugs. 30 (10): 951–83. doi:10.1007/s40263-016-0362-3. ISSN 1172-7047. PMID 27421270. ^ Barnaby Page (5 March 2015). "World's law-makers favour basing e-cig rules on tobacco". ECigIntelligence. Tamarind Media Limited. ^ Lempert, Lauren K; Grana, Rachel; Glantz, Stanton A (2016). "The importance of product definitions in US e-cigarette laws and regulations". Tobacco Control. 25 (e1): e44–e51. doi:10.1136/tobaccocontrol-2014-051913. ISSN 0964-4563. PMC 4466213. PMID 25512432. ^ a b "U.S. Department of Transportation Explicitly Bans the Use of Electronic Cigarettes on Commercial Flights". 2 March 2016. Retrieved 3 March 2016. ^ "What the RCP thinks about tobacco". RCP London. 1 February 2018. Retrieved 3 May 2018. ^ Sienuic, Kat (29 September 2014). "Public health officers tackle hazy issue of e-cigarettes". The Globe and Mail. ^ Kadowaki, Joy; Vuolo, Mike; Kelly, Brian C. (2015). "A review of the current geographic distribution of and debate surrounding electronic cigarette clean air regulations in the United States". Health & Place. 31: 75–82. doi:10.1016/j.healthplace.2014.11.003. ISSN 1353-8292. PMC 4305454. PMID 25463920. ^ "E-cigarettes to be stubbed out for under-18s". BBC News. 26 January 2014. ^ a b c "The Facts on the FDA's New Tobacco Rule". US Department of Health and Human Services. US Food and Drug Administration. 7 August 2016. ^ "Retailer Overview of FDA Regulations for Selling Tobacco Products". US Department of Health and Human Services. US Food and Drug Administration. 8 August 2016. ^ Eric Lipton (2 September 2016). "A Lobbyist Wrote the Bill. Will the Tobacco Industry Win Its E-Cigarette Fight?". The New York Times. ^ Gray, Eliza (27 February 2014). "Europe Sets New Rules for E-Cigs While the U.S. Drags Its Feet". Time. ^ "Deeming Tobacco Products To Be Subject to the Federal Food, Drug, and Cosmetic Act, as Amended by the Family Smoking Prevention and Tobacco Control Act; Regulations on the Sale and Distribution of Tobacco Products and Required Warning Statements for Tobacco Products". Federal Register. US Food and Drug Administration. 79 (80): 23142–23207. 25 April 2014. ^ Sabrina Tavernise (24 April 2014). "F.D.A. Will Propose New Regulations for E-Cigarettes". The New York Times. ^ National Conference of State Legislatures (5 May 2016). "Alternative Nicotine Products Electronic Cigarettes". National Conference of State Legislatures. ^ Products, Office of the Commissioner, Center for Tobacco. "Press Announcements - Statement from FDA Commissioner Scott Gottlieb, M.D., on proposed new steps to protect youth by preventing access to flavored tobacco products and banning menthol in cigarettes". www.fda.gov. Retrieved 2018-11-25. ^ Cervellin, Gianfranco; Borghi, Loris; Mattiuzzi, Camilla; Meschi, Tiziana; Favaloro, Emmanuel; Lippi, Giuseppe (2013). "E-Cigarettes and Cardiovascular Risk: Beyond Science and Mysticism". Seminars in Thrombosis and Hemostasis. 40 (1): 060–065. doi:10.1055/s-0033-1363468. ISSN 0094-6176. PMID 24343348. ^ Maloney, Erin K.; Cappella, Joseph N. (2015). "Does Vaping in E-Cigarette Advertisements Affect Tobacco Smoking Urge, Intentions, and Perceptions in Daily, Intermittent, and Former Smokers?". Health Communication. 31 (1): 1–10. doi:10.1080/10410236.2014.993496. ISSN 1041-0236. PMID 25758192. ^ a b Bekki, Kanae; Uchiyama, Shigehisa; Ohta, Kazushi; Inaba, Yohei; Nakagome, Hideki; Kunugita, Naoki (2014). "Carbonyl Compounds Generated from Electronic Cigarettes". International Journal of Environmental Research and Public Health. 11 (11): 11192–11200. doi:10.3390/ijerph111111192. ISSN 1660-4601. PMC 4245608. PMID 25353061. ^ a b c d Daniel Nasaw (5 December 2012). "Electronic cigarettes challenge anti-smoking efforts". BBC News. ^ "E-cigarettes and Lung Health". American Lung Association. 2015. ^ "Myths and Facts About E-cigarettes". American Lung Association. 2015. ^ Fernández, Esteve; Ballbè, Montse; Sureda, Xisca; Fu, Marcela; Saltó, Esteve; Martínez-Sánchez, Jose M. (2015). "Particulate Matter from Electronic Cigarettes and Conventional Cigarettes: a Systematic Review and Observational Study". Current Environmental Health Reports. 2 (4): 423–9. doi:10.1007/s40572-015-0072-x. ISSN 2196-5412. PMID 26452675. ^ Peter Evans (20 February 2015). "E-Cigarette Makers Face Rise of Counterfeits". Wall Street Journal. ^ Gurdus, Elizabeth (23 April 2018). "Cramer: Vaping is decimating the cigarette industry—and it could get even worse". CNBC. Retrieved 2 May 2018. ^ Jourdan, Adam (25 May 2014). ""Vaping" a slow burner in China, world's maker of e-cigarettes". Reuters. Retrieved 29 February 2016. ^ Liao, Allen (1 September 2015). "Chinese E-cigarette Makers Shift to Domestic Markets". Tobacco Asia. Retrieved 29 February 2016. ^ Kessel, Jonah M. (13 December 2014). "China's E-Cigarette Boom". The New York Times. Retrieved 29 February 2016. ^ Meera Senthilingam (23 March 2015). "E-cigarettes: Helping smokers quit, or fueling a new addiction?". CNN. ^ Richard Craver (29 May 2015). "Vuse overwhelming e-cig competition". Winston-Salem Journal. Retrieved 29 July 2015. ^ a b Melissa Vonder Haar (28 May 2014). "Nielsen: Electronic Cigarette Dollar Sales Decline". CSP Magazine. ^ Mickle, Tripp. "FDA Cloud Hangs Over Vape Shops". The Wall Street Journal. Retrieved 17 December 2015. ^ Esterl, Mike (26 August 2014). "Big Tobacco's E-Cigarette Push Gets a Reality Check". The Wall Street Journal. Retrieved 17 December 2015. ^ a b Will Yakowicz (10 June 2015). "This Silicon Valley Company Just Raised $47 Million to Smoke Cigarette Makers". Inc.
^ a b Craver, Richard (25 August 2018). "Juul expands e-cig market share gap with Reynolds' Vuse". Winston-Salem Journal. Retrieved 28 August 2018. ^ "JUUL copycats are flooding the e-cigarette market". Truth Initiative. August 8, 2018. Retrieved October 28, 2018. ^ Yuen, Jenny (4 July 2015). "'Wild West' for e-cigarette use in Canada, critic says". Toronto Sun. Retrieved 2 March 2016. ^ Aedan Helmer (6 April 2014). "E-cig retailers stand up to Health Canada". Ottawa Sun. ^ Hammond, D; White, CM; Czoli, CD; Martin, CL; Magennis, P; Shiplo, S (9 October 2015). "Retail availability and marketing of electronic cigarettes in Canada" (PDF). Canadian Journal of Public Health. 106 (6): e408–12. doi:10.17269/cjph.106.5105. PMID 26680433. Retrieved 2 March 2016. ^ a b c Lastennet, Vincent (7 February 2016). "Cigarettes électroniques. Le marché de la vape en deux cartes". Le Télégramme. Retrieved 1 March 2016. ^ "BAT unit to market nicotine inhaler". Tobacco Journal International. 2011. ^ Mark Odell (12 September 2014). "British American Tobacco nicotine inhaler wins regulatory approval". Financial Times. Retrieved 18 September 2014. ^ Michael Felberbaum (26 May 2011). "Philip Morris Int'l buys rights to nicotine system". Boston Globe. Associated Press. ^ "New smoking cessation therapy proves promising". Esciencenews.com. 27 February 2010. Retrieved 27 August 2013. ^ Brad Stone (21 November 2013). "Ploom's E-Cigarettes and Vaporizers Use Real Tobacco". Bloomberg Businessweek. ^ Melissa Vonder Haar (11 March 2015). "PAX Labs CEO Teases 'Fundamentally Different' E-Cigarette". CSP Magazine. ^ Levy, Ari (17 December 2017). "E-cigarette maker Juul is raising $150 million after spinning out of vaping company". CNBC News. Retrieved 4 August 2018. ^ Candice Nguyen (1 February 2014). "'E-Hookah' Debuts in San Diego Amid Critics". NBCUniversal. ^ Alexandra Ma (11 August 2015). "This Is What It's Like To Vape Caffeine". The Huffington Post.